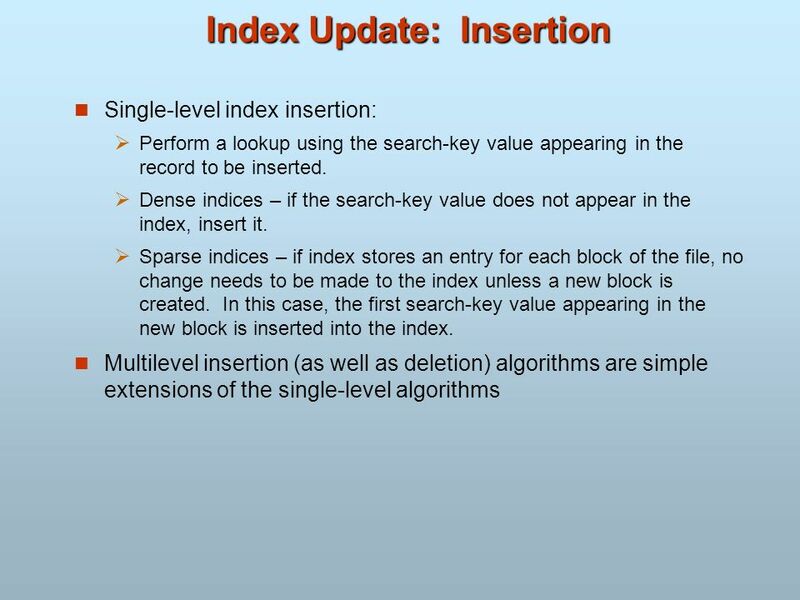 Ordered Indices Indexing techniques evaluated on basis of: In an ordered index, index entries are stored sorted on the search key value. E.g., author catalog in library. 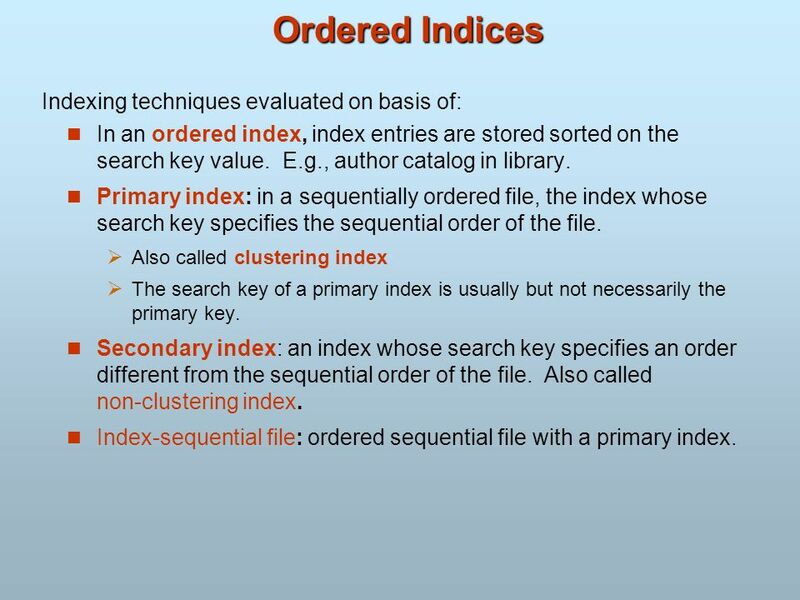 Primary index: in a sequentially ordered file, the index whose search key specifies the sequential order of the file. 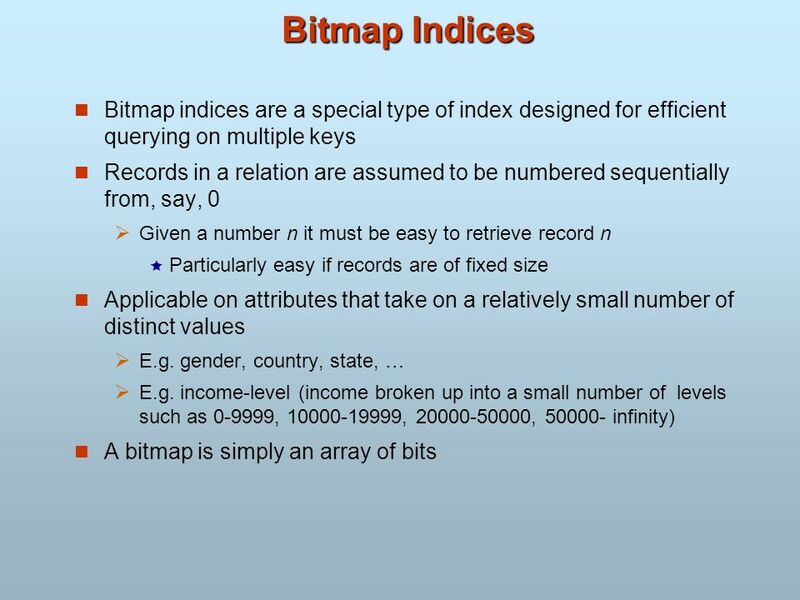 Also called clustering index The search key of a primary index is usually but not necessarily the primary key. 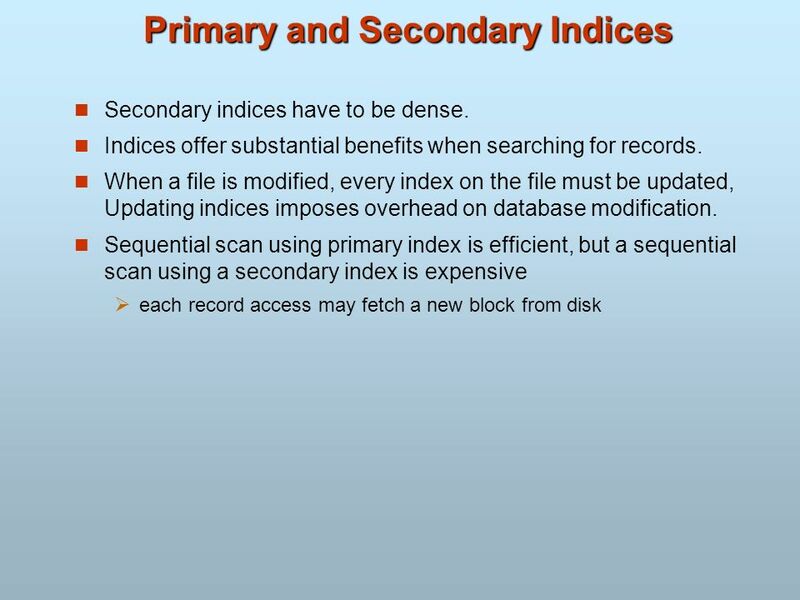 Secondary index: an index whose search key specifies an order different from the sequential order of the file. Also called non-clustering index. 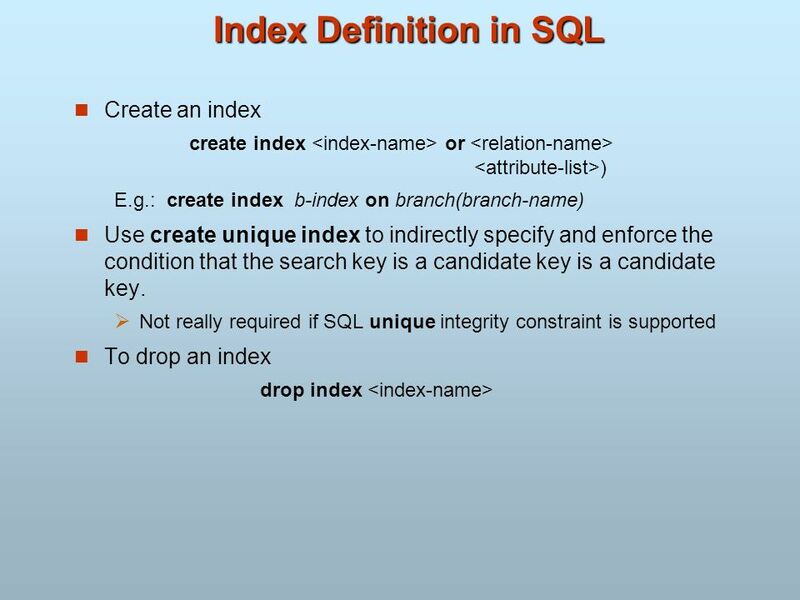 Index-sequential file: ordered sequential file with a primary index. 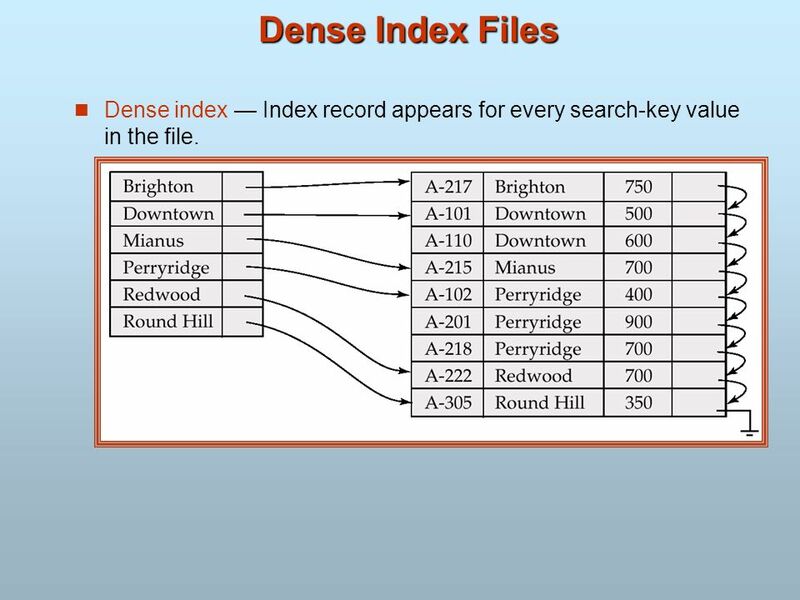 5 Dense Index Files Dense index — Index record appears for every search-key value in the file. 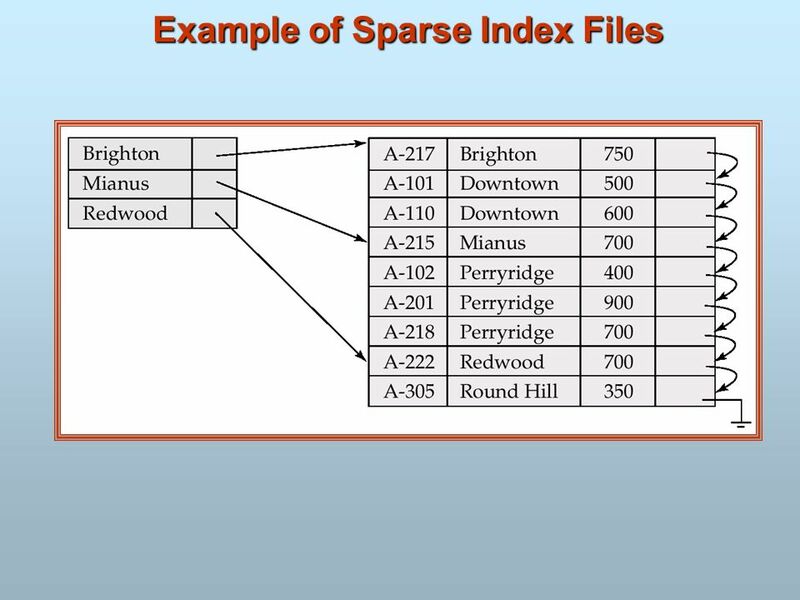 6 Sparse Index Files Sparse Index: contains index records for only some search-key values. 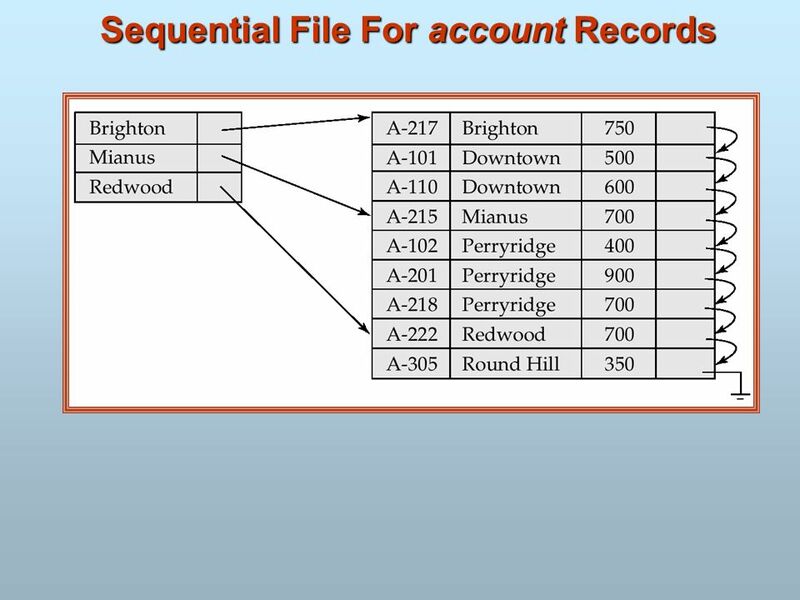 Applicable when records are sequentially ordered on search-key To locate a record with search-key value K we: Find index record with largest search-key value < K Search file sequentially starting at the record to which the index record points Less space and less maintenance overhead for insertions and deletions. Generally slower than dense index for locating records. Good tradeoff: sparse index with an index entry for every block in file, corresponding to least search-key value in the block. 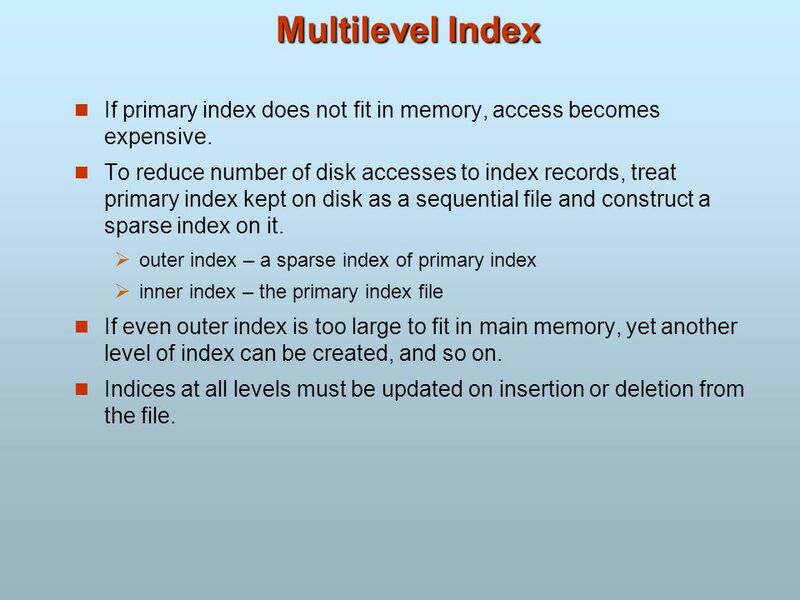 8 Multilevel Index If primary index does not fit in memory, access becomes expensive. To reduce number of disk accesses to index records, treat primary index kept on disk as a sequential file and construct a sparse index on it. 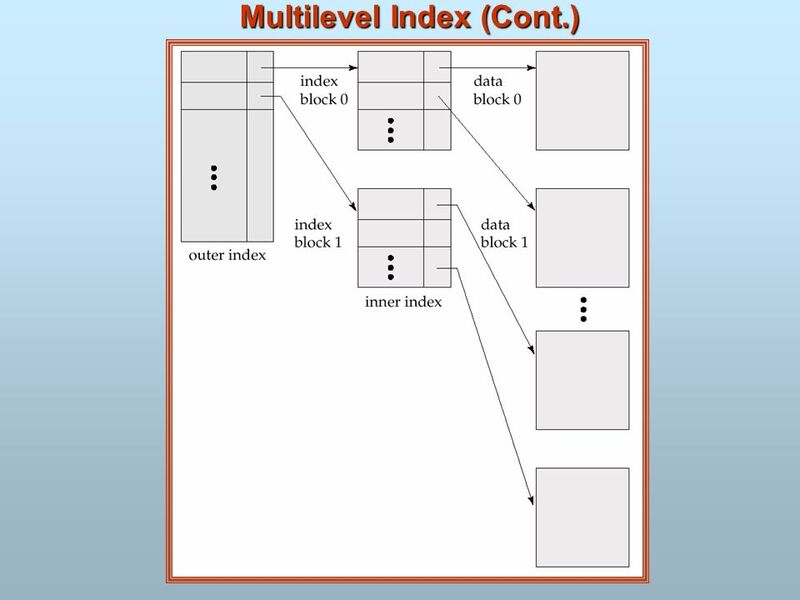 outer index – a sparse index of primary index inner index – the primary index file If even outer index is too large to fit in main memory, yet another level of index can be created, and so on. Indices at all levels must be updated on insertion or deletion from the file. If deleted record was the only record in the file with its particular search-key value, the search-key is deleted from the index also. 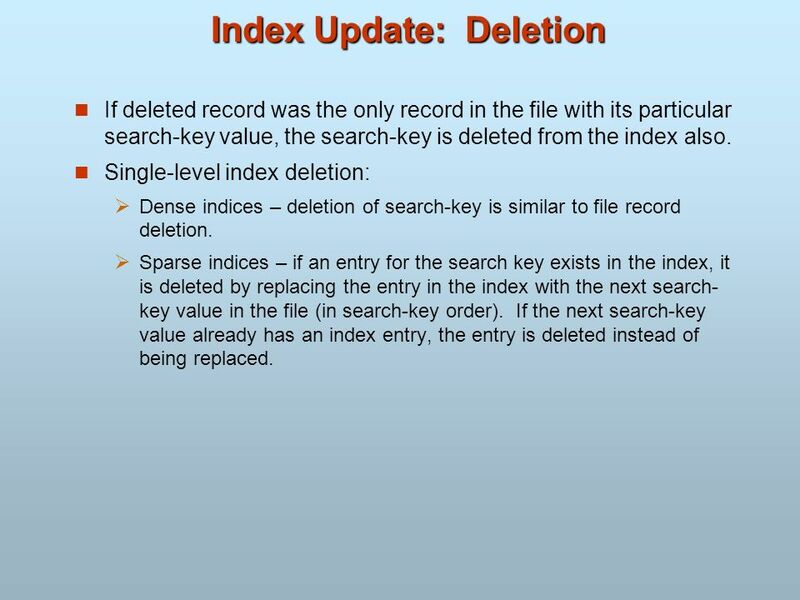 Single-level index deletion: Dense indices – deletion of search-key is similar to file record deletion. 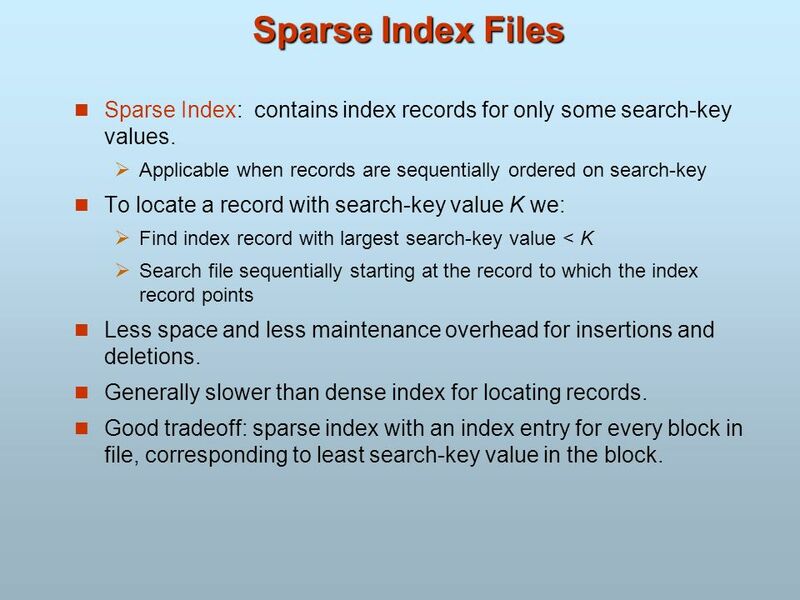 Sparse indices – if an entry for the search key exists in the index, it is deleted by replacing the entry in the index with the next search-key value in the file (in search-key order). If the next search-key value already has an index entry, the entry is deleted instead of being replaced. 12 Secondary Indices Frequently, one wants to find all the records whose values in a certain field (which is not the search-key of the primary index satisfy some condition. 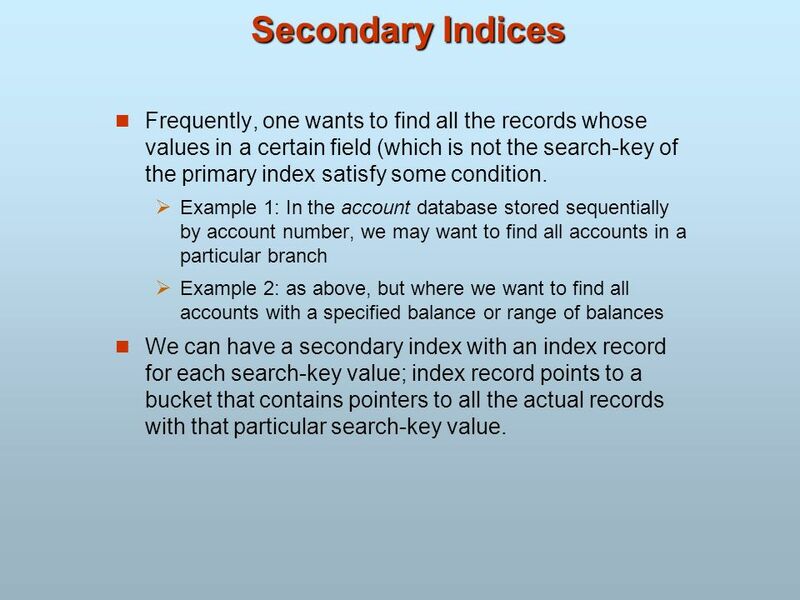 Example 1: In the account database stored sequentially by account number, we may want to find all accounts in a particular branch Example 2: as above, but where we want to find all accounts with a specified balance or range of balances We can have a secondary index with an index record for each search-key value; index record points to a bucket that contains pointers to all the actual records with that particular search-key value. 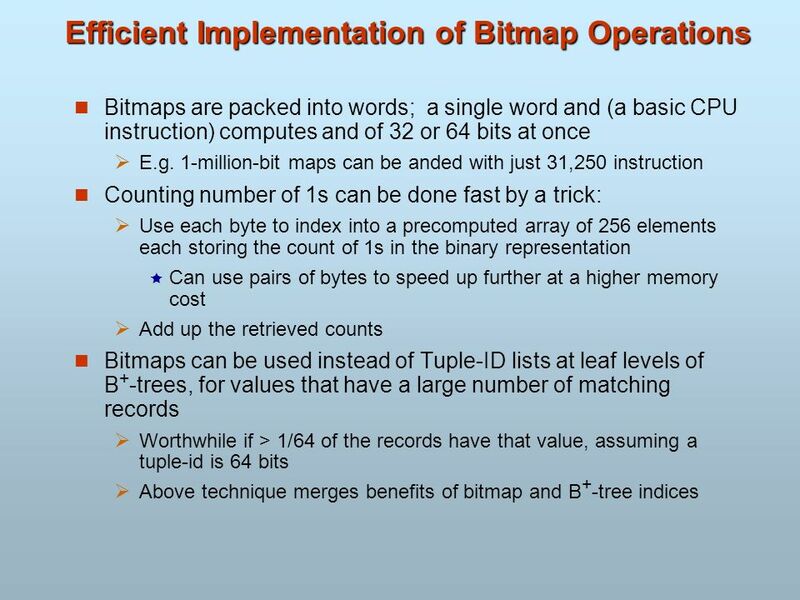 15 B+-tree indices are an alternative to indexed-sequential files. 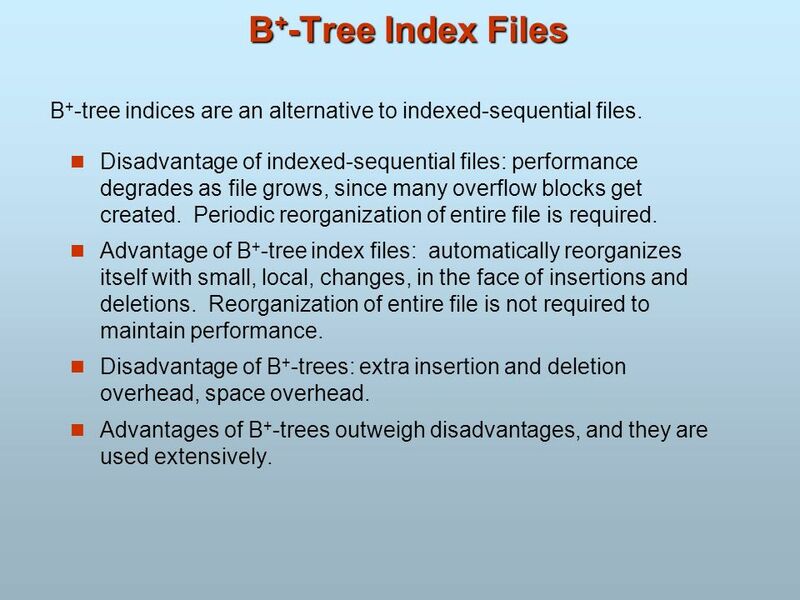 B+-Tree Index Files B+-tree indices are an alternative to indexed-sequential files. Disadvantage of indexed-sequential files: performance degrades as file grows, since many overflow blocks get created. Periodic reorganization of entire file is required. Advantage of B+-tree index files: automatically reorganizes itself with small, local, changes, in the face of insertions and deletions. Reorganization of entire file is not required to maintain performance. Disadvantage of B+-trees: extra insertion and deletion overhead, space overhead. Advantages of B+-trees outweigh disadvantages, and they are used extensively. 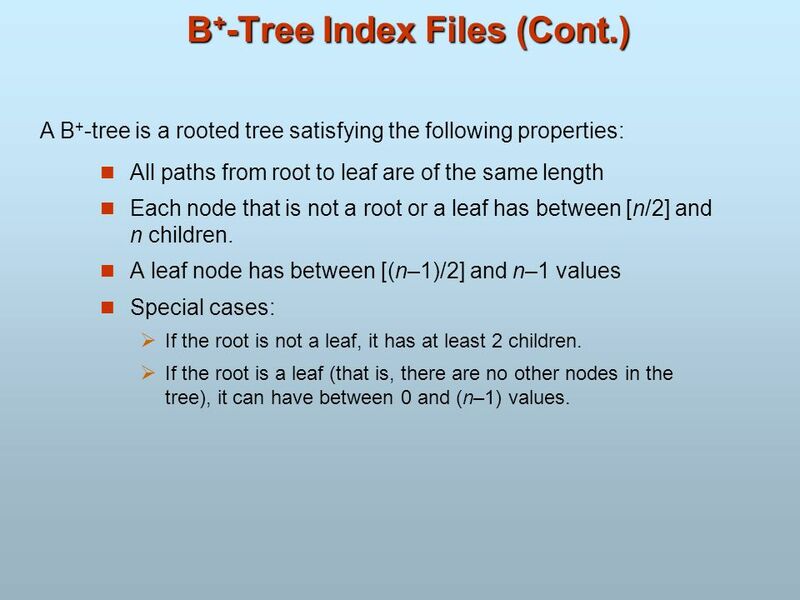 A B+-tree is a rooted tree satisfying the following properties: All paths from root to leaf are of the same length Each node that is not a root or a leaf has between [n/2] and n children. A leaf node has between [(n–1)/2] and n–1 values Special cases: If the root is not a leaf, it has at least 2 children. If the root is a leaf (that is, there are no other nodes in the tree), it can have between 0 and (n–1) values. 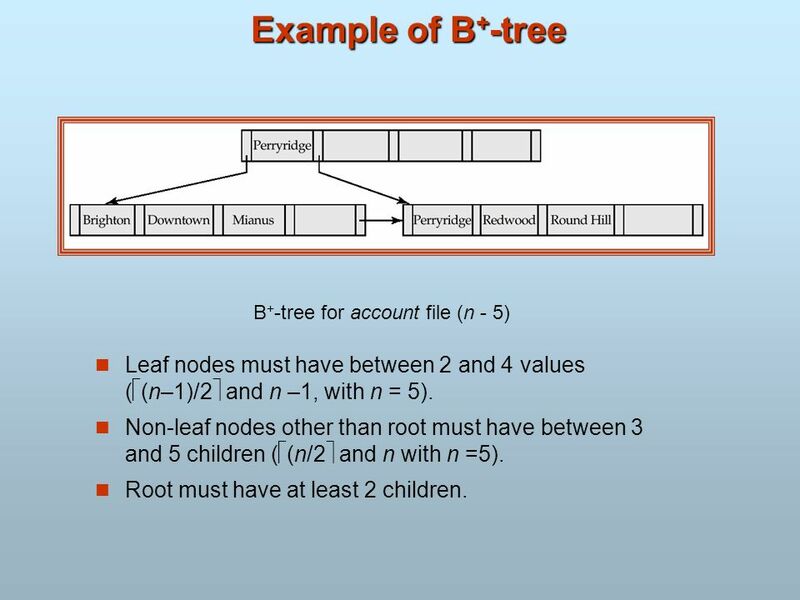 Example of B+-tree B+-tree for account file (n - 5) Leaf nodes must have between 2 and 4 values ((n–1)/2 and n –1, with n = 5). Non-leaf nodes other than root must have between 3 and 5 children ((n/2 and n with n =5). Root must have at least 2 children. Since the inter-node connections are done by pointers, “logically” close blocks need not be “physically” close. The non-leaf levels of the B+-tree form a hierarchy of sparse indices. 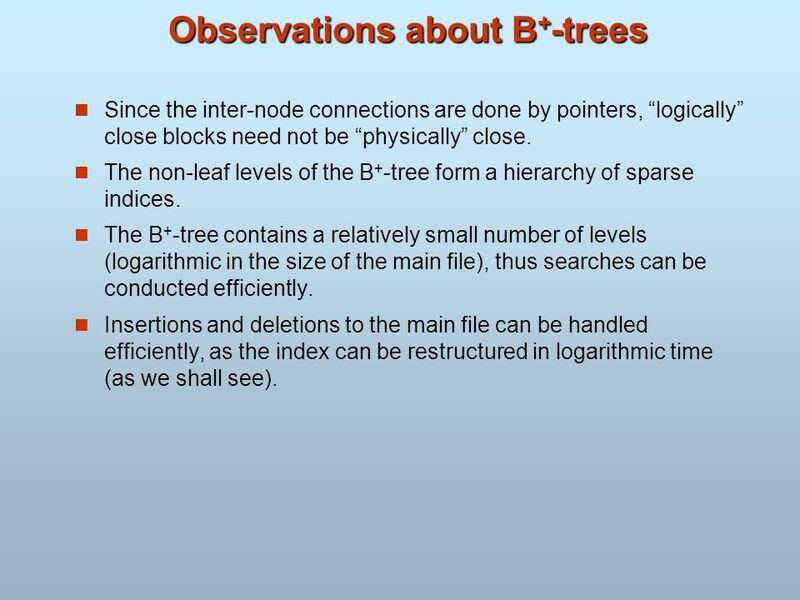 The B+-tree contains a relatively small number of levels (logarithmic in the size of the main file), thus searches can be conducted efficiently. Insertions and deletions to the main file can be handled efficiently, as the index can be restructured in logarithmic time (as we shall see). 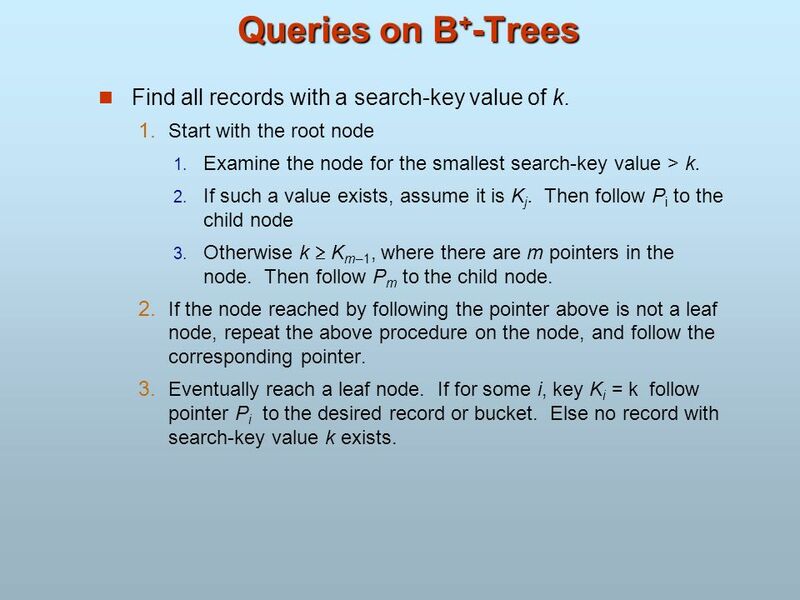 23 Queries on B+-Trees Find all records with a search-key value of k.
Start with the root node Examine the node for the smallest search-key value > k. If such a value exists, assume it is Kj. Then follow Pi to the child node Otherwise k  Km–1, where there are m pointers in the node. Then follow Pm to the child node. If the node reached by following the pointer above is not a leaf node, repeat the above procedure on the node, and follow the corresponding pointer. Eventually reach a leaf node. If for some i, key Ki = k follow pointer Pi to the desired record or bucket. Else no record with search-key value k exists. In processing a query, a path is traversed in the tree from the root to some leaf node. If there are K search-key values in the file, the path is no longer than  logn/2(K). A node is generally the same size as a disk block, typically 4 kilobytes, and n is typically around 100 (40 bytes per index entry). With 1 million search key values and n = 100, at most log50(1,000,000) = 4 nodes are accessed in a lookup. 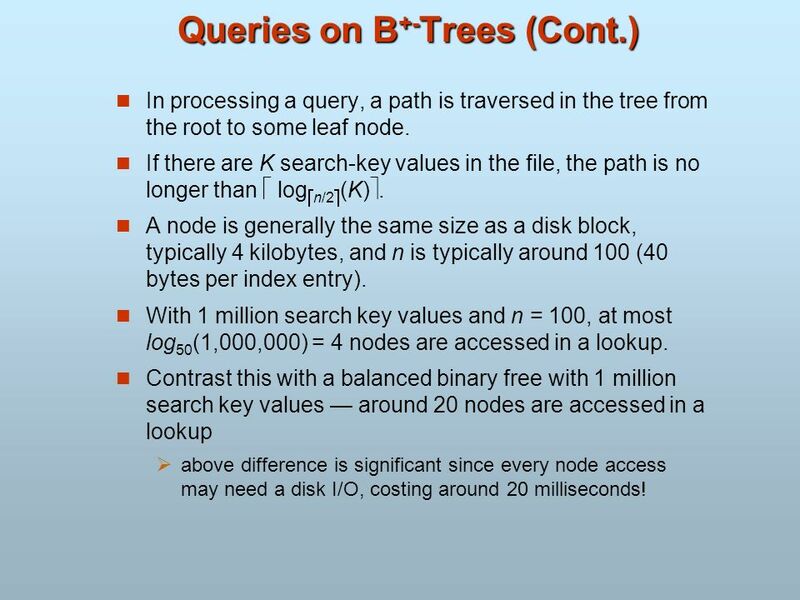 Contrast this with a balanced binary free with 1 million search key values — around 20 nodes are accessed in a lookup above difference is significant since every node access may need a disk I/O, costing around 20 milliseconds! 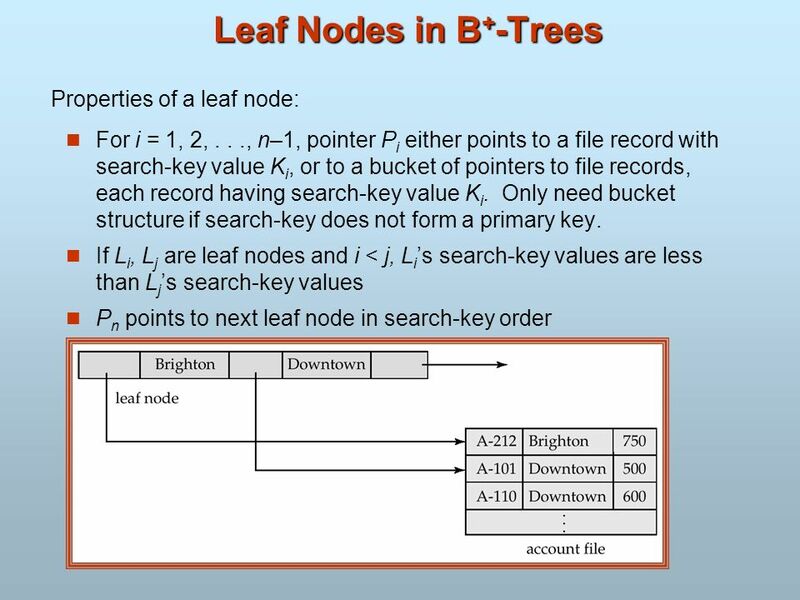 Find the leaf node in which the search-key value would appear If the search-key value is already there in the leaf node, record is added to file and if necessary a pointer is inserted into the bucket. If the search-key value is not there, then add the record to the main file and create a bucket if necessary. Then: If there is room in the leaf node, insert (key-value, pointer) pair in the leaf node Otherwise, split the node (along with the new (key-value, pointer) entry) as discussed in the next slide. 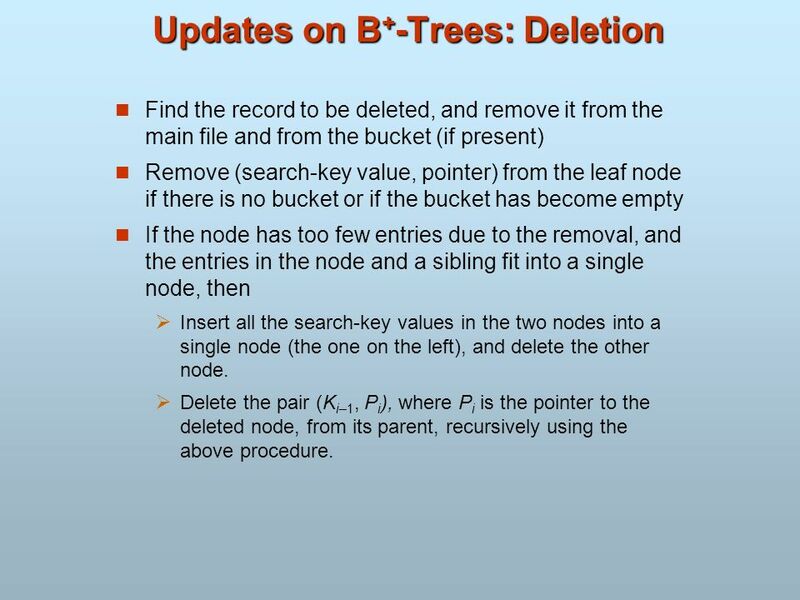 Find the record to be deleted, and remove it from the main file and from the bucket (if present) Remove (search-key value, pointer) from the leaf node if there is no bucket or if the bucket has become empty If the node has too few entries due to the removal, and the entries in the node and a sibling fit into a single node, then Insert all the search-key values in the two nodes into a single node (the one on the left), and delete the other node. Delete the pair (Ki–1, Pi), where Pi is the pointer to the deleted node, from its parent, recursively using the above procedure. Otherwise, if the node has too few entries due to the removal, and the entries in the node and a sibling fit into a single node, then Redistribute the pointers between the node and a sibling such that both have more than the minimum number of entries. Update the corresponding search-key value in the parent of the node. The node deletions may cascade upwards till a node which has n/2  or more pointers is found. 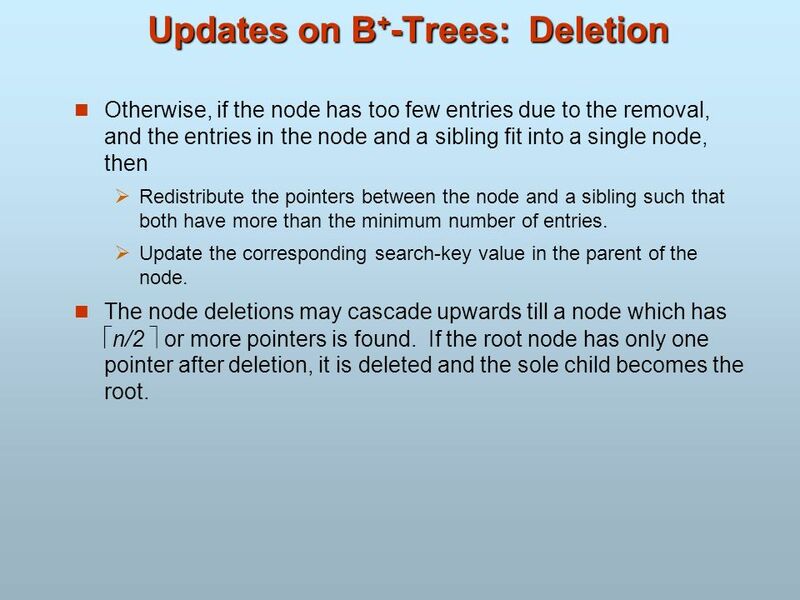 If the root node has only one pointer after deletion, it is deleted and the sole child becomes the root. 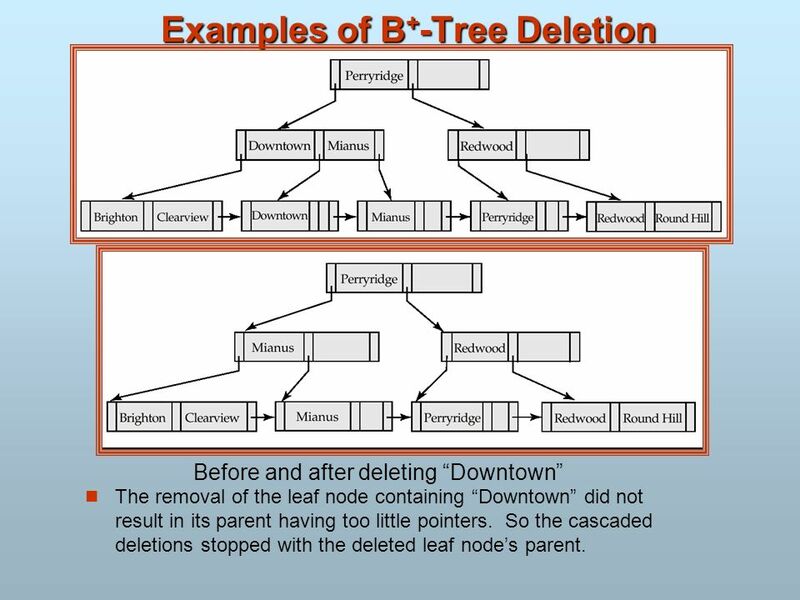 Before and after deleting “Downtown” The removal of the leaf node containing “Downtown” did not result in its parent having too little pointers. So the cascaded deletions stopped with the deleted leaf node’s parent. 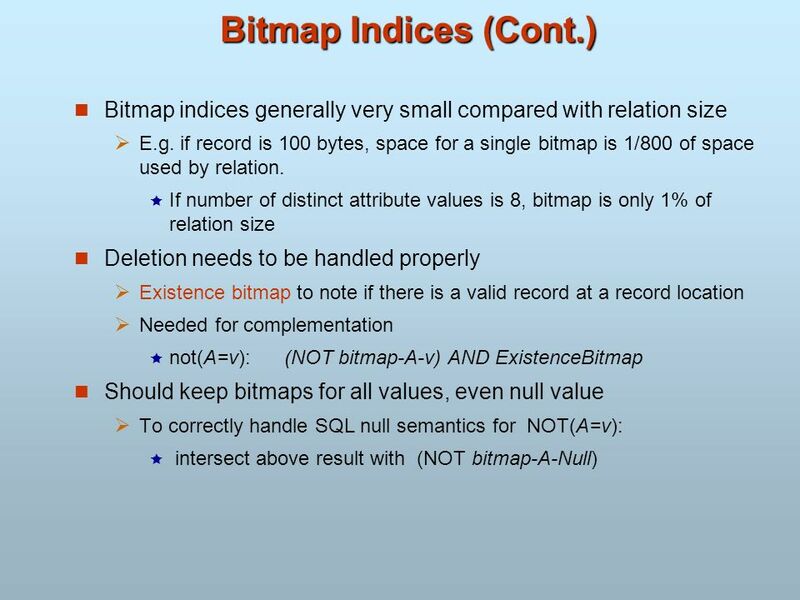 Index file degradation problem is solved by using B+-Tree indices. 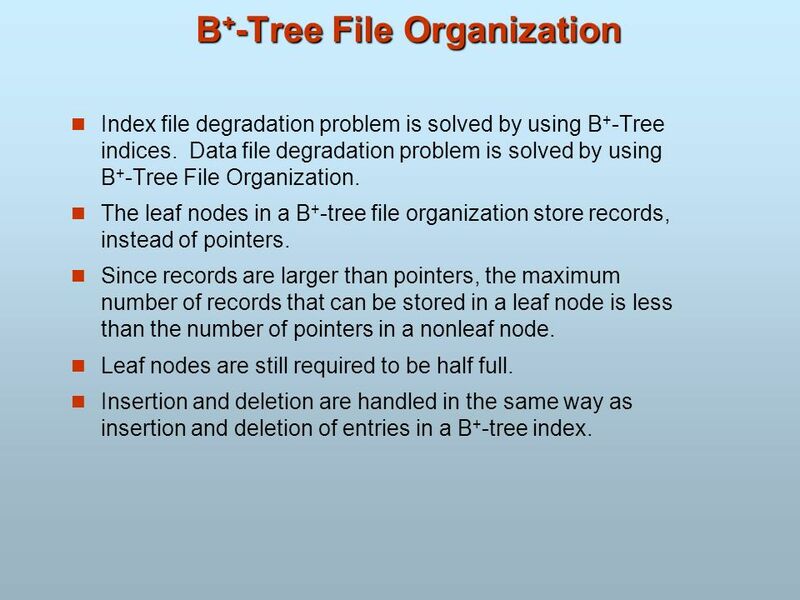 Data file degradation problem is solved by using B+-Tree File Organization. 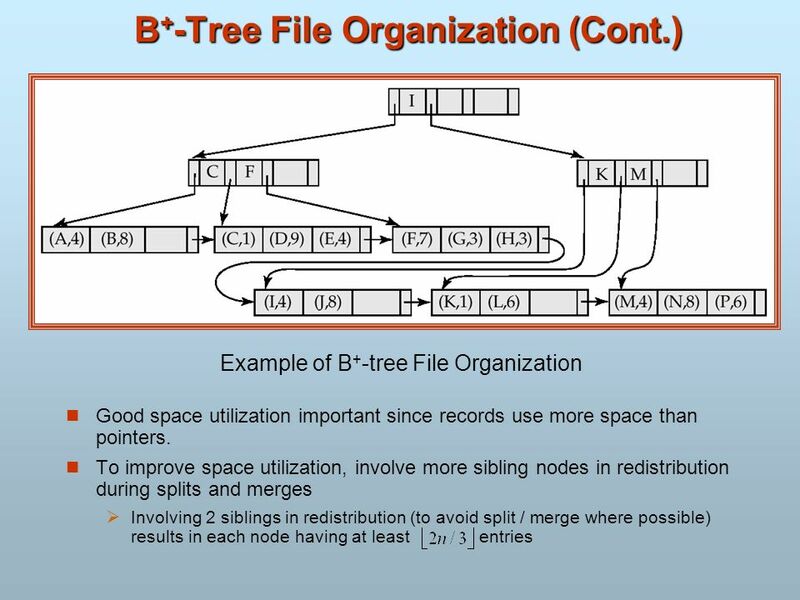 The leaf nodes in a B+-tree file organization store records, instead of pointers. Since records are larger than pointers, the maximum number of records that can be stored in a leaf node is less than the number of pointers in a nonleaf node. Leaf nodes are still required to be half full. 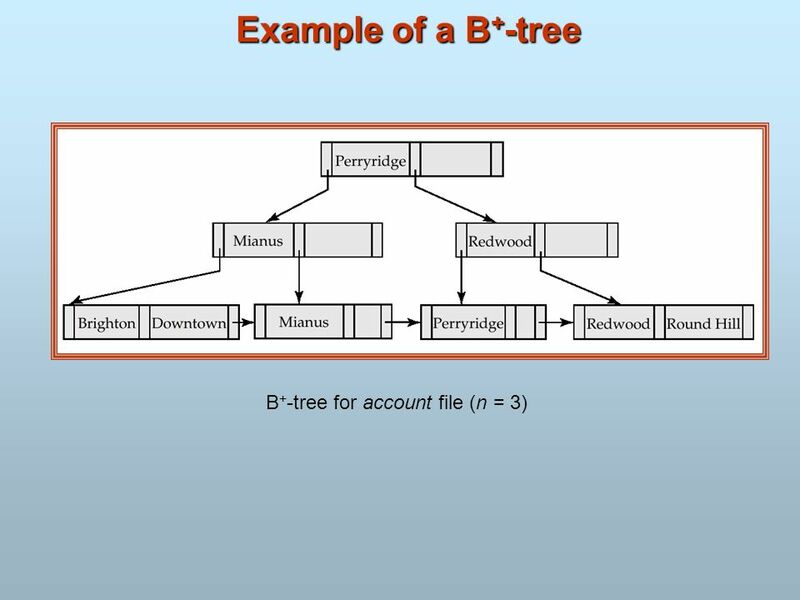 Insertion and deletion are handled in the same way as insertion and deletion of entries in a B+-tree index. 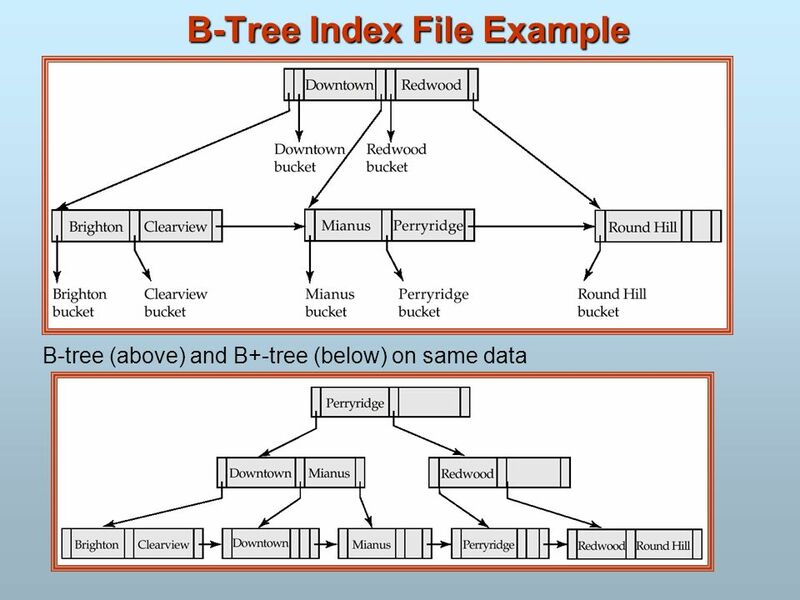 35 B-Tree Index Files Similar to B+-tree, but B-tree allows search-key values to appear only once; eliminates redundant storage of search keys. 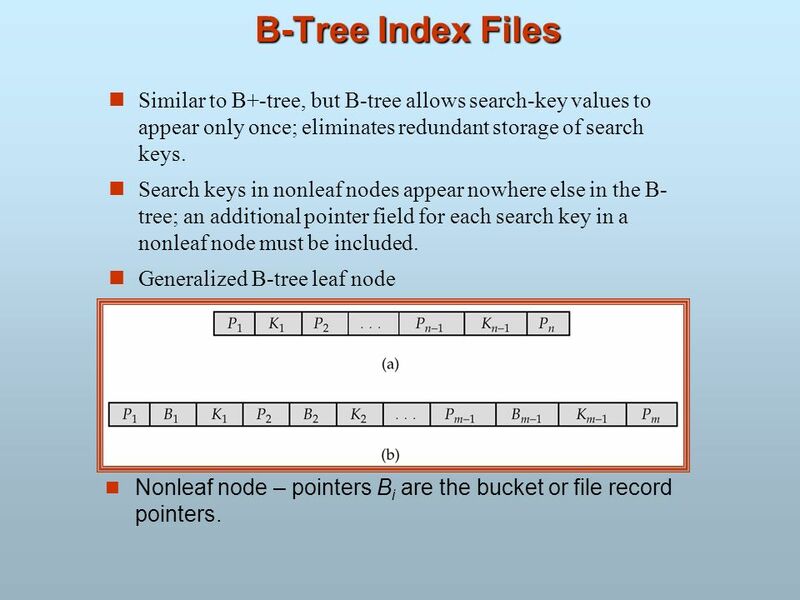 Search keys in nonleaf nodes appear nowhere else in the B-tree; an additional pointer field for each search key in a nonleaf node must be included. 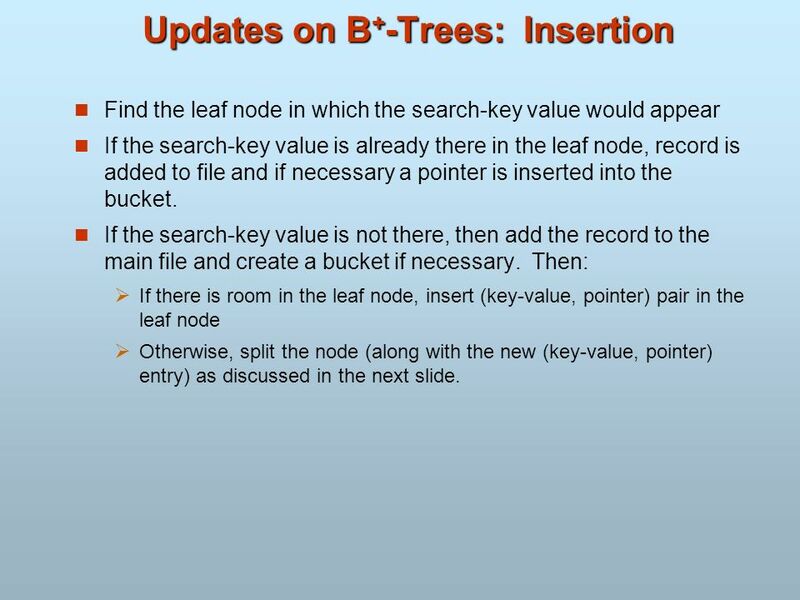 Generalized B-tree leaf node Nonleaf node – pointers Bi are the bucket or file record pointers. 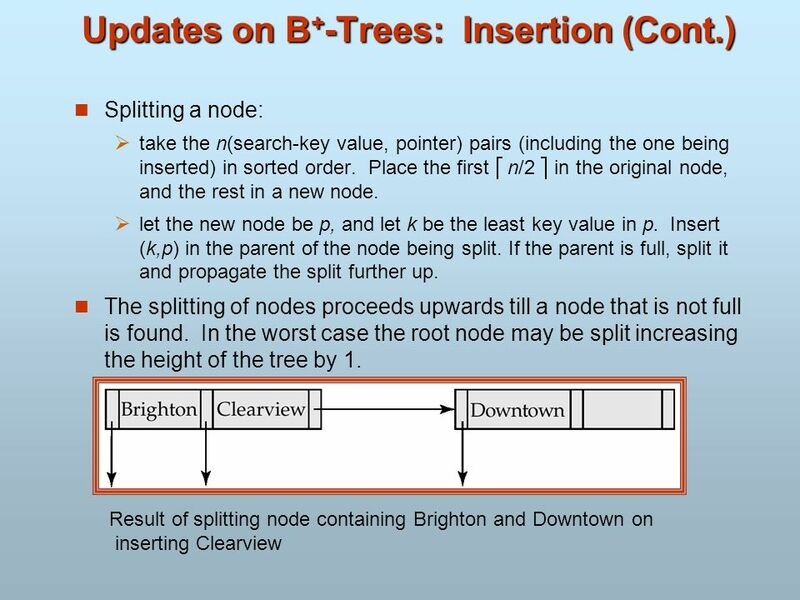 Advantages of B-Tree indices: May use less tree nodes than a corresponding B+-Tree. 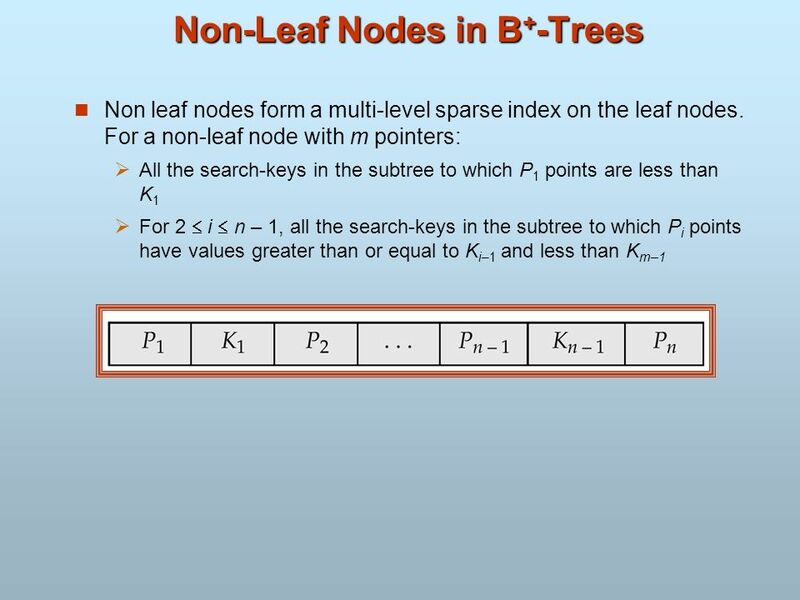 Sometimes possible to find search-key value before reaching leaf node. 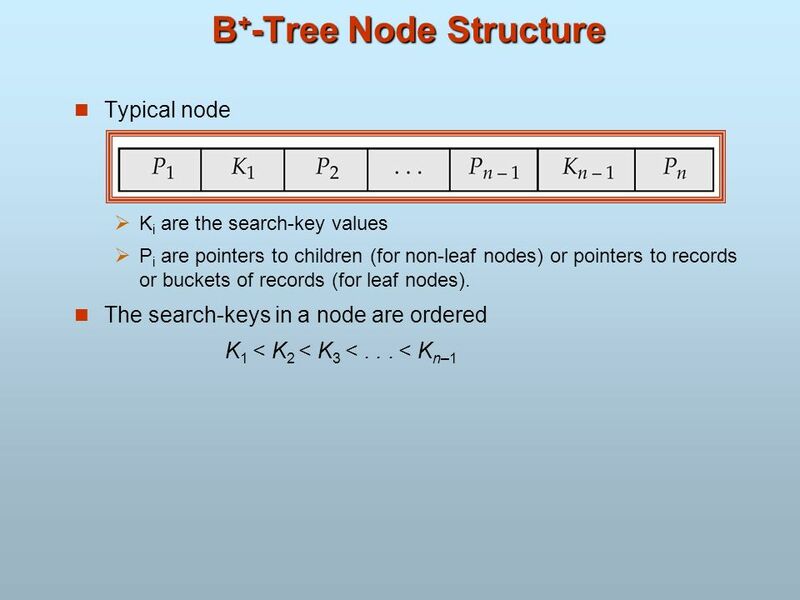 Disadvantages of B-Tree indices: Only small fraction of all search-key values are found early Non-leaf nodes are larger, so fan-out is reduced. 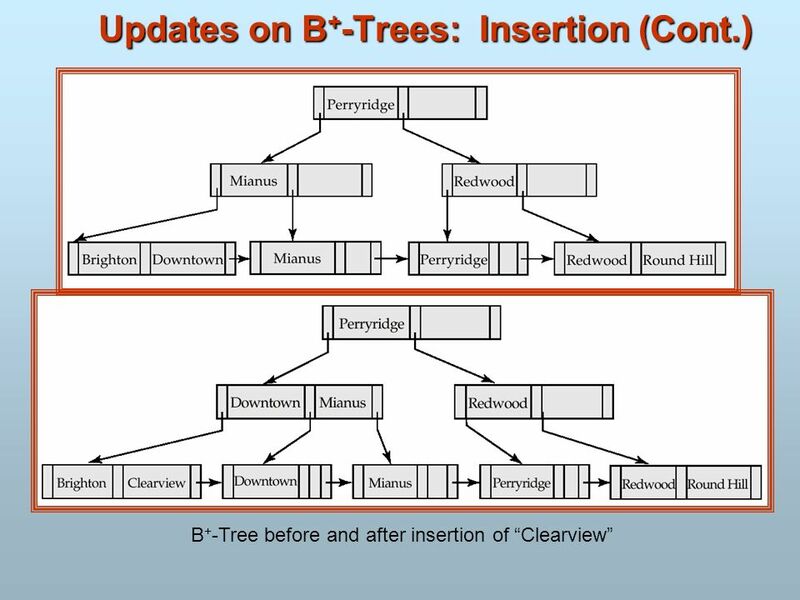 Thus B-Trees typically have greater depth than corresponding B+-Tree Insertion and deletion more complicated than in B+-Trees Implementation is harder than B+-Trees. 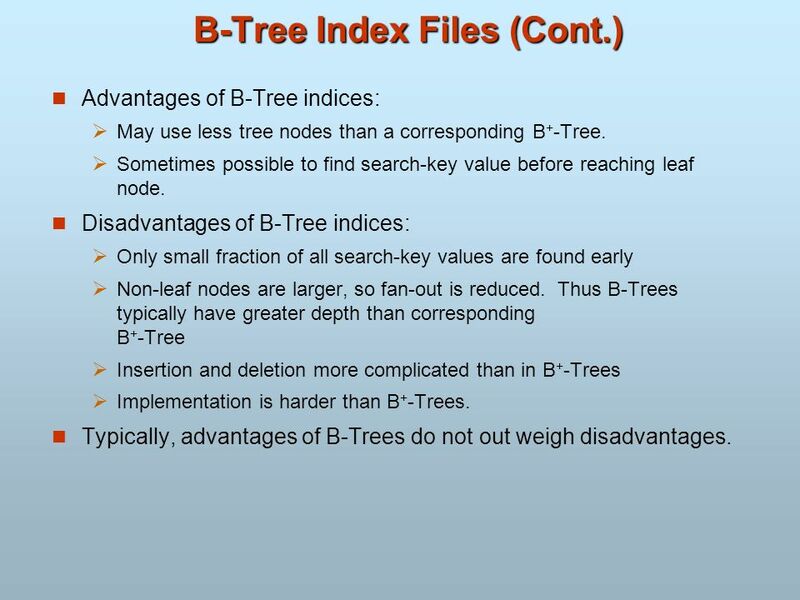 Typically, advantages of B-Trees do not out weigh disadvantages. 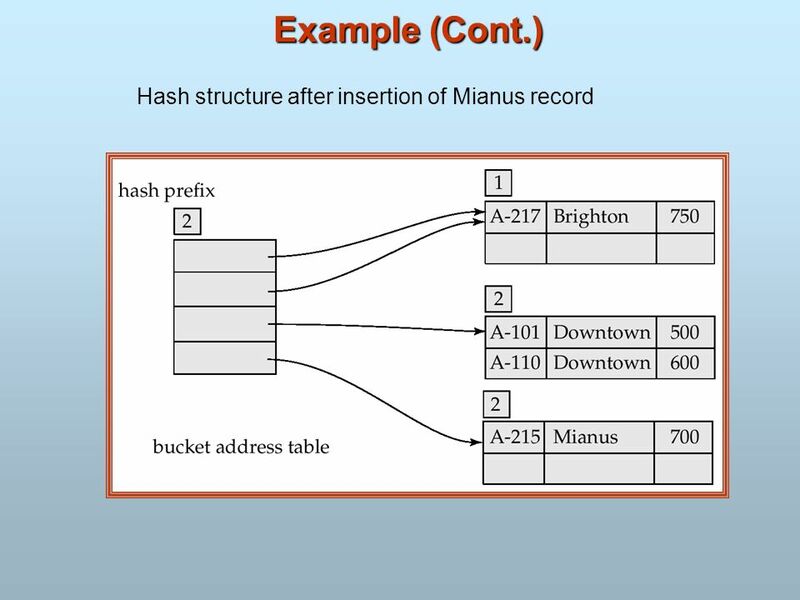 38 Static Hashing A bucket is a unit of storage containing one or more records (a bucket is typically a disk block). 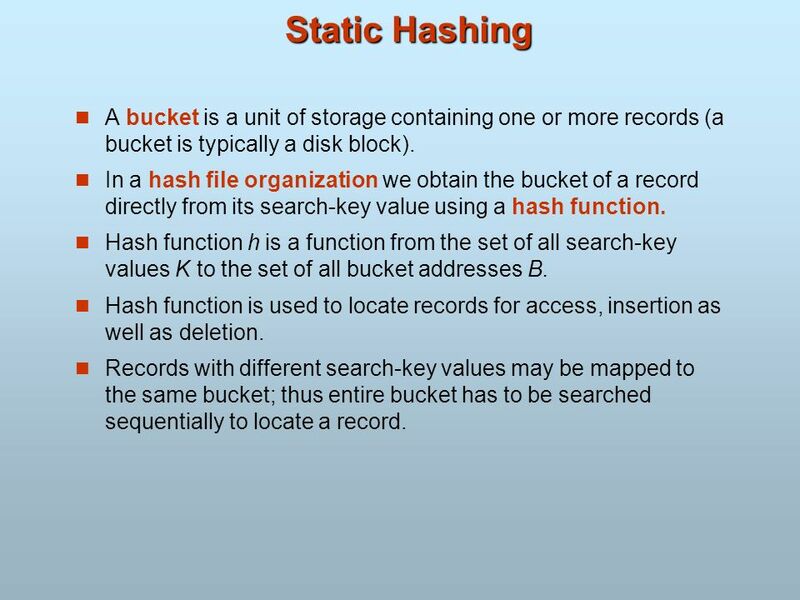 In a hash file organization we obtain the bucket of a record directly from its search-key value using a hash function. 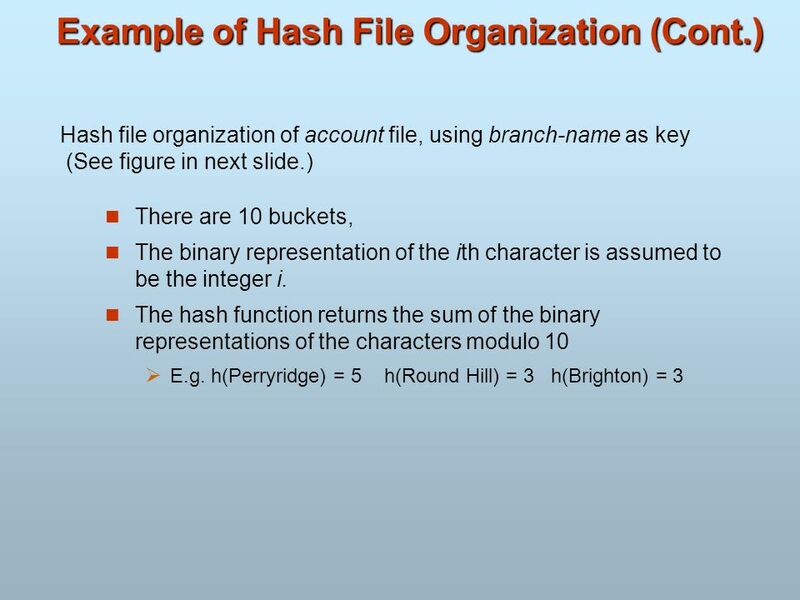 Hash function h is a function from the set of all search-key values K to the set of all bucket addresses B. Hash function is used to locate records for access, insertion as well as deletion. Records with different search-key values may be mapped to the same bucket; thus entire bucket has to be searched sequentially to locate a record. 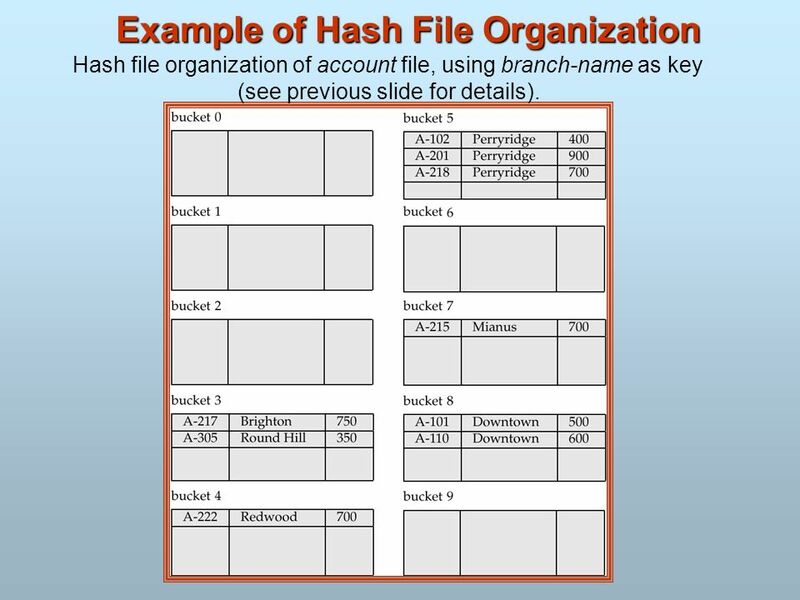 Hash file organization of account file, using branch-name as key (see previous slide for details). 41 Hash Functions Worst has function maps all search-key values to the same bucket; this makes access time proportional to the number of search-key values in the file. 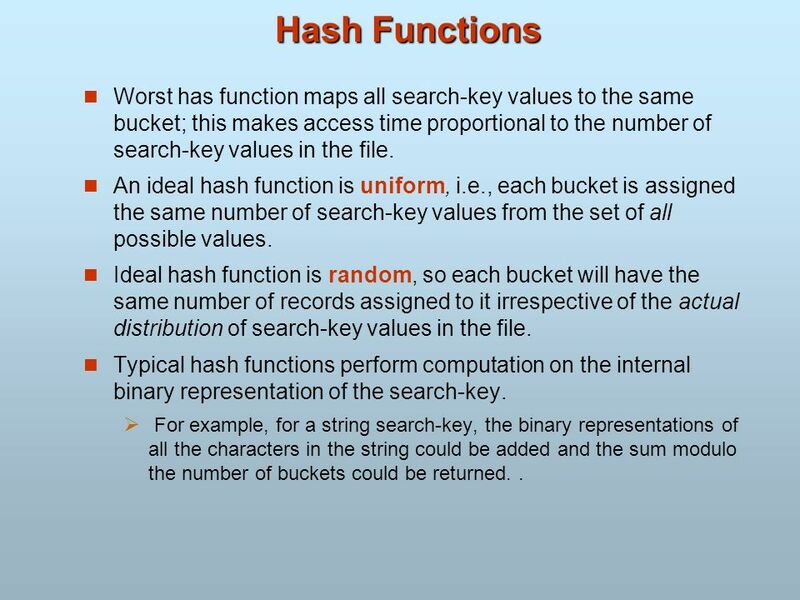 An ideal hash function is uniform, i.e., each bucket is assigned the same number of search-key values from the set of all possible values. 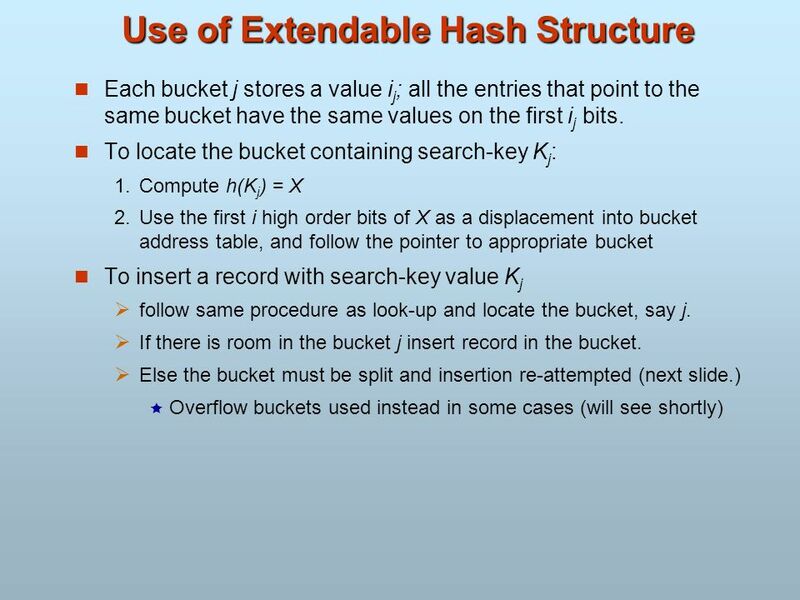 Ideal hash function is random, so each bucket will have the same number of records assigned to it irrespective of the actual distribution of search-key values in the file. Typical hash functions perform computation on the internal binary representation of the search-key. For example, for a string search-key, the binary representations of all the characters in the string could be added and the sum modulo the number of buckets could be returned. .
Bucket overflow can occur because of Insufficient buckets Skew in distribution of records. 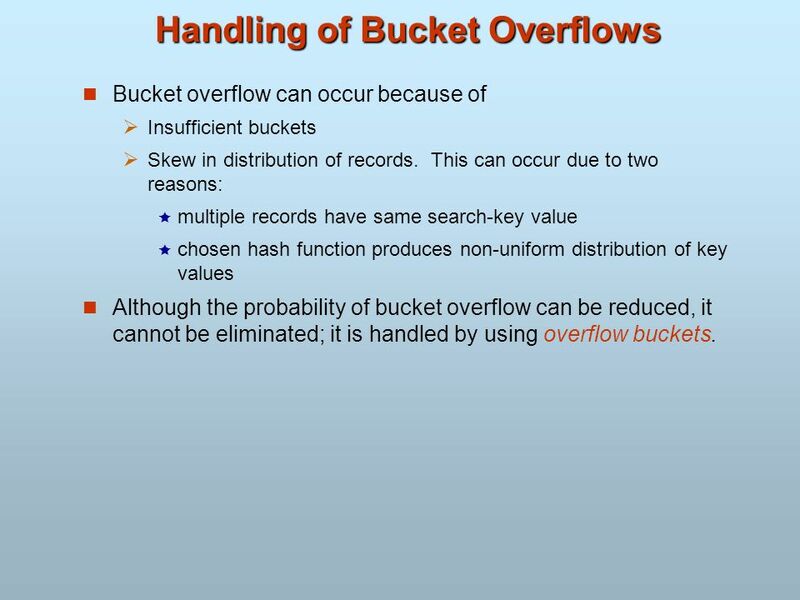 This can occur due to two reasons: multiple records have same search-key value chosen hash function produces non-uniform distribution of key values Although the probability of bucket overflow can be reduced, it cannot be eliminated; it is handled by using overflow buckets. 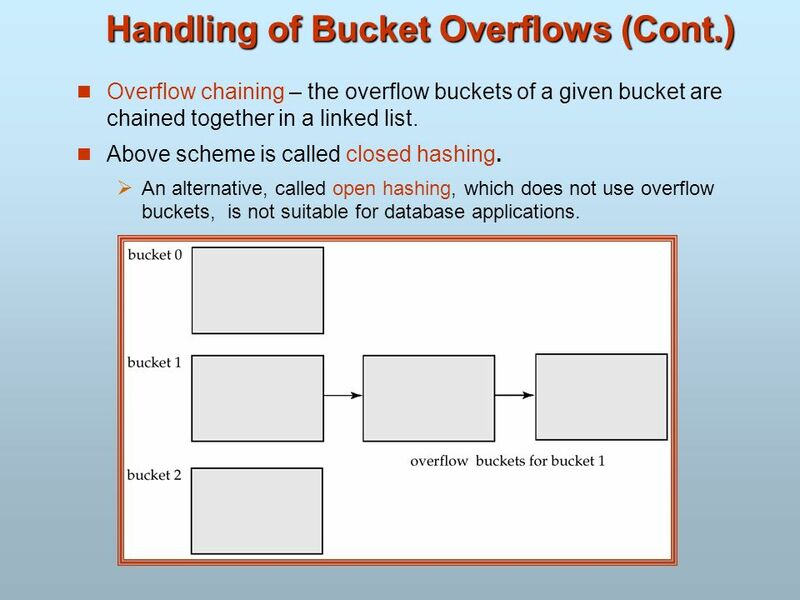 Overflow chaining – the overflow buckets of a given bucket are chained together in a linked list. 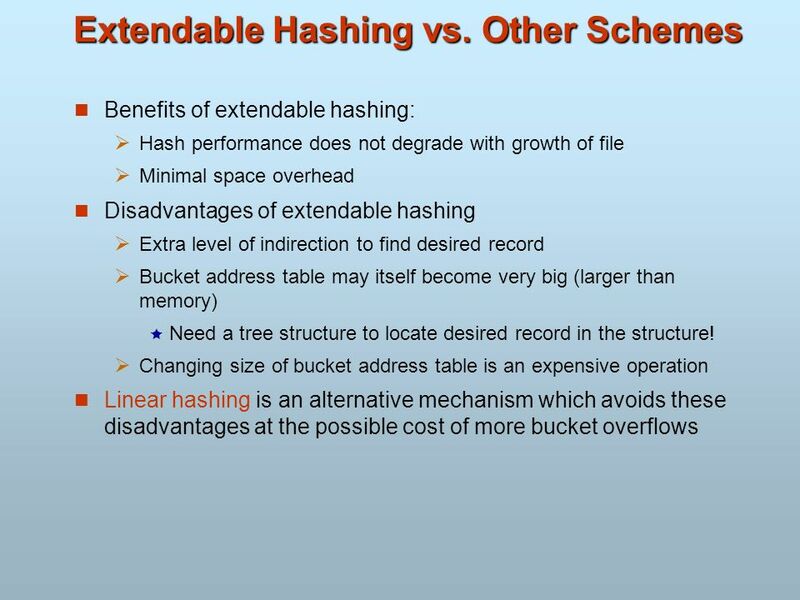 Above scheme is called closed hashing. 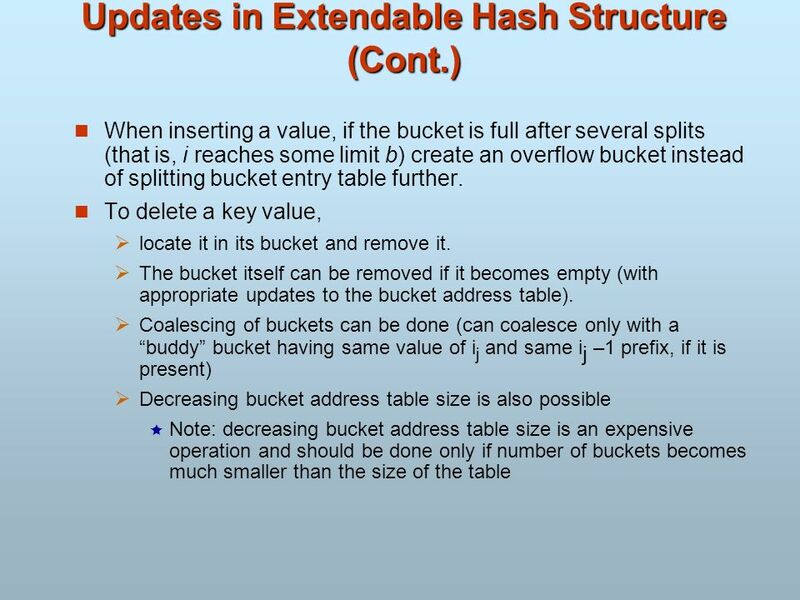 An alternative, called open hashing, which does not use overflow buckets, is not suitable for database applications. 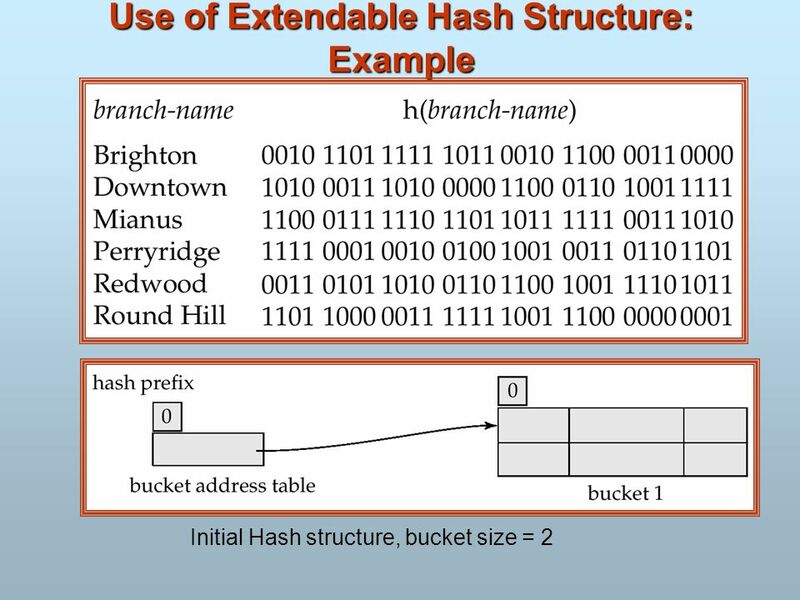 44 Hash Indices Hashing can be used not only for file organization, but also for index-structure creation. 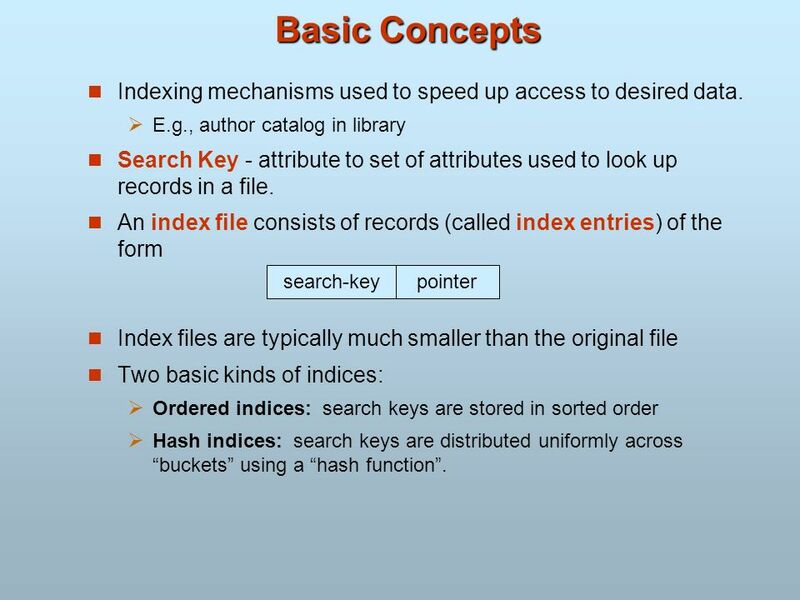 A hash index organizes the search keys, with their associated record pointers, into a hash file structure. 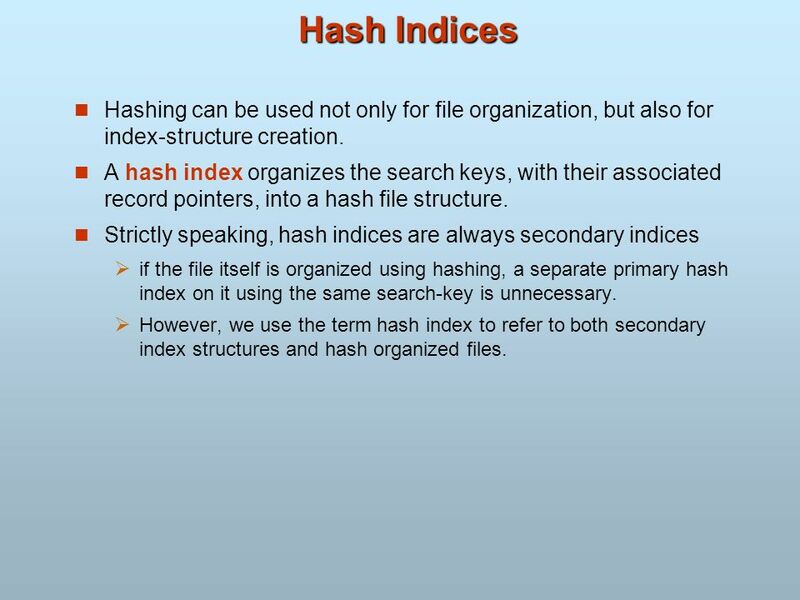 Strictly speaking, hash indices are always secondary indices if the file itself is organized using hashing, a separate primary hash index on it using the same search-key is unnecessary. 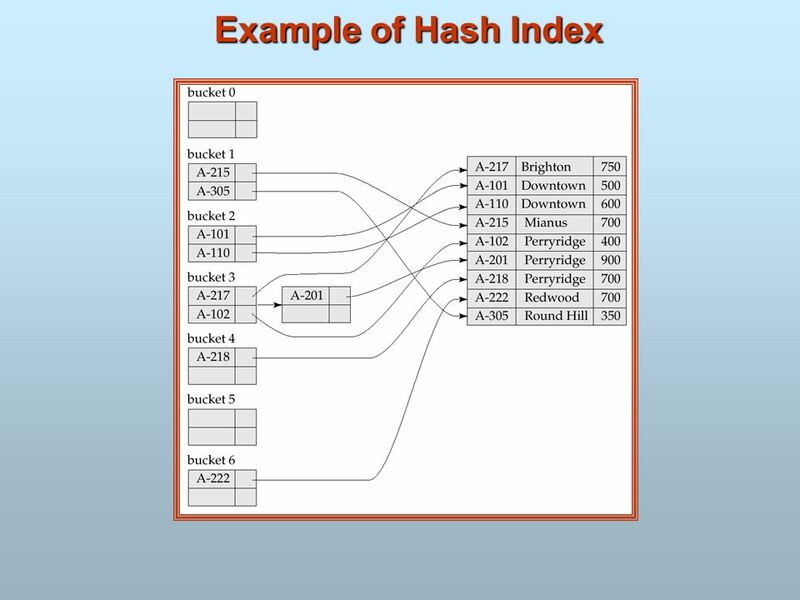 However, we use the term hash index to refer to both secondary index structures and hash organized files. 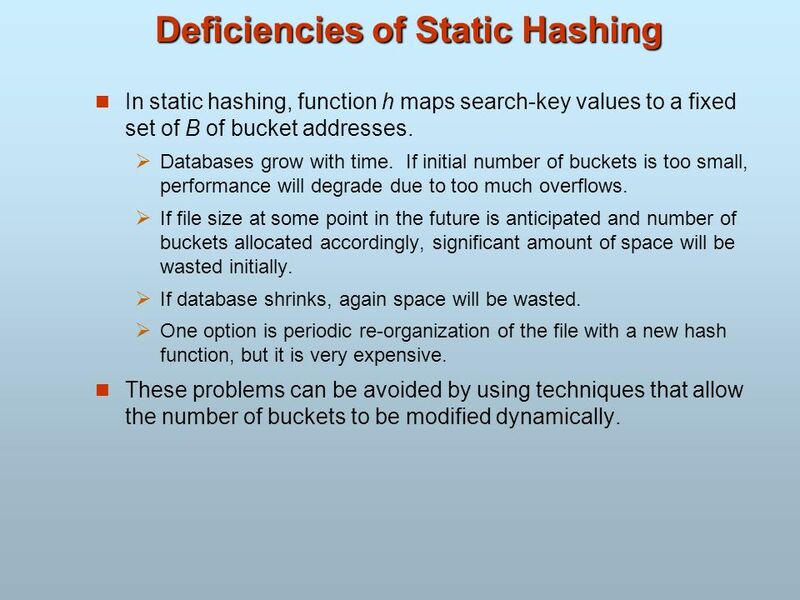 In static hashing, function h maps search-key values to a fixed set of B of bucket addresses. Databases grow with time. 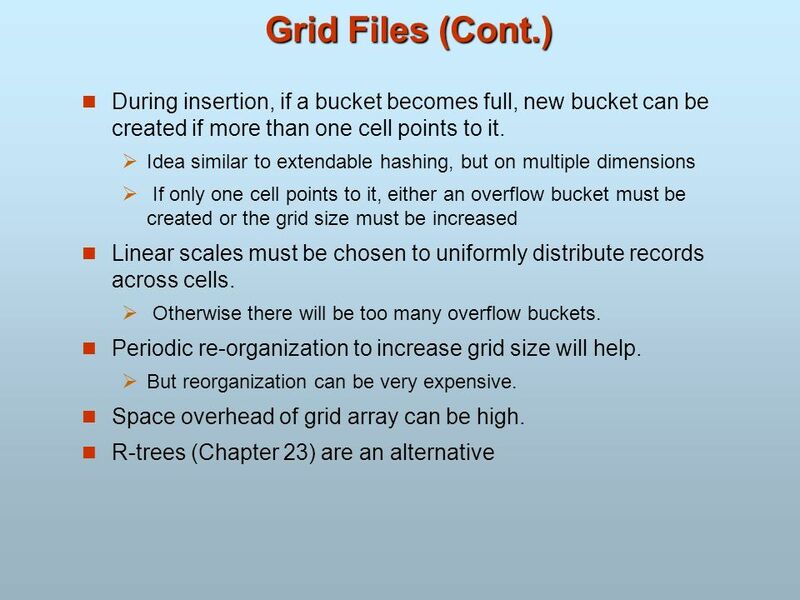 If initial number of buckets is too small, performance will degrade due to too much overflows. If file size at some point in the future is anticipated and number of buckets allocated accordingly, significant amount of space will be wasted initially. If database shrinks, again space will be wasted. One option is periodic re-organization of the file with a new hash function, but it is very expensive. These problems can be avoided by using techniques that allow the number of buckets to be modified dynamically. 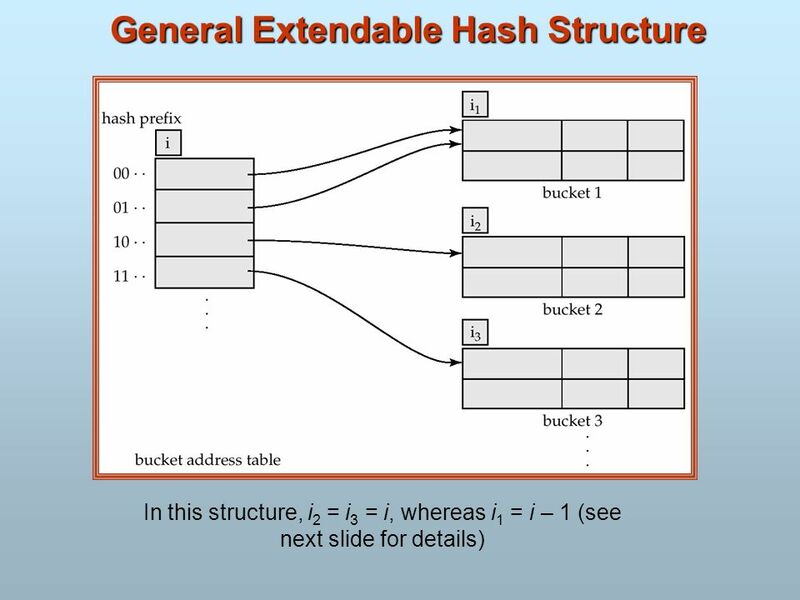 Allows the hash function to be modified dynamically Extendable hashing – one form of dynamic hashing Hash function generates values over a large range — typically b-bit integers, with b = 32. 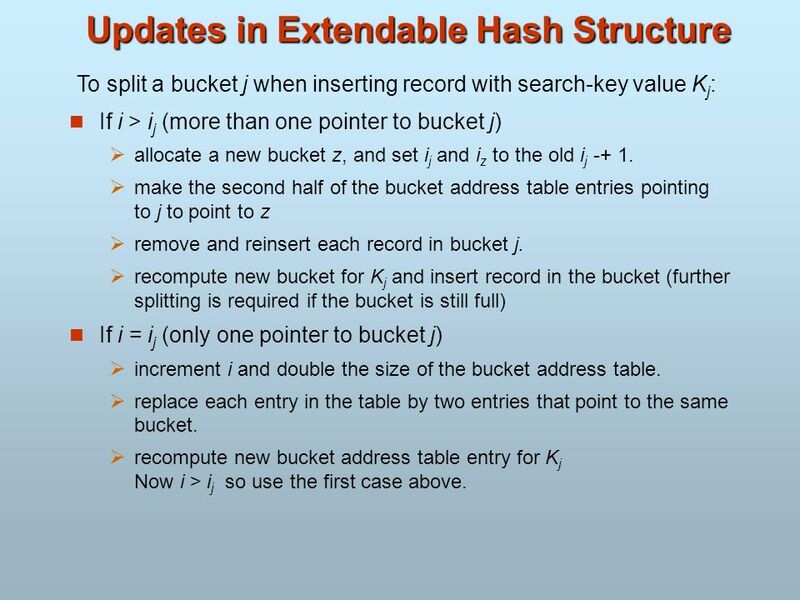 At any time use only a prefix of the hash function to index into a table of bucket addresses. Let the length of the prefix be i bits, 0  i  32. Bucket address table size = 2i. Initially i = 0 Value of i grows and shrinks as the size of the database grows and shrinks. 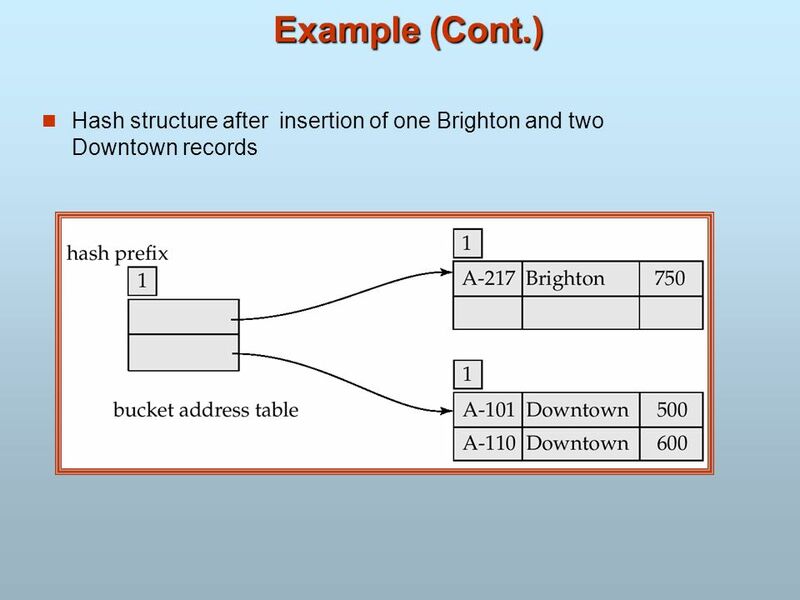 Multiple entries in the bucket address table may point to a bucket. Thus, actual number of buckets is < 2i The number of buckets also changes dynamically due to coalescing and splitting of buckets. To split a bucket j when inserting record with search-key value Kj: If i > ij (more than one pointer to bucket j) allocate a new bucket z, and set ij and iz to the old ij -+ 1. make the second half of the bucket address table entries pointing to j to point to z remove and reinsert each record in bucket j. recompute new bucket for Kj and insert record in the bucket (further splitting is required if the bucket is still full) If i = ij (only one pointer to bucket j) increment i and double the size of the bucket address table. replace each entry in the table by two entries that point to the same bucket. recompute new bucket address table entry for Kj Now i > ij so use the first case above. 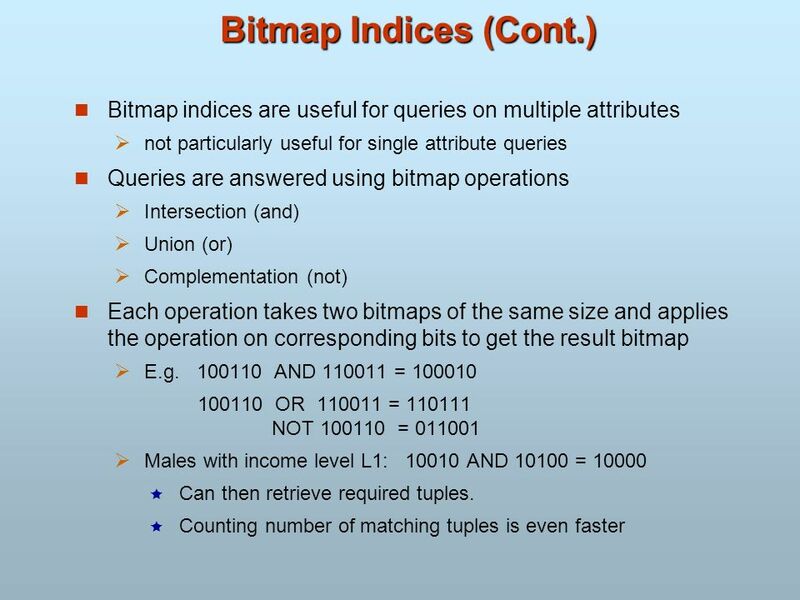 60 Multiple-Key Access Use multiple indices for certain types of queries. 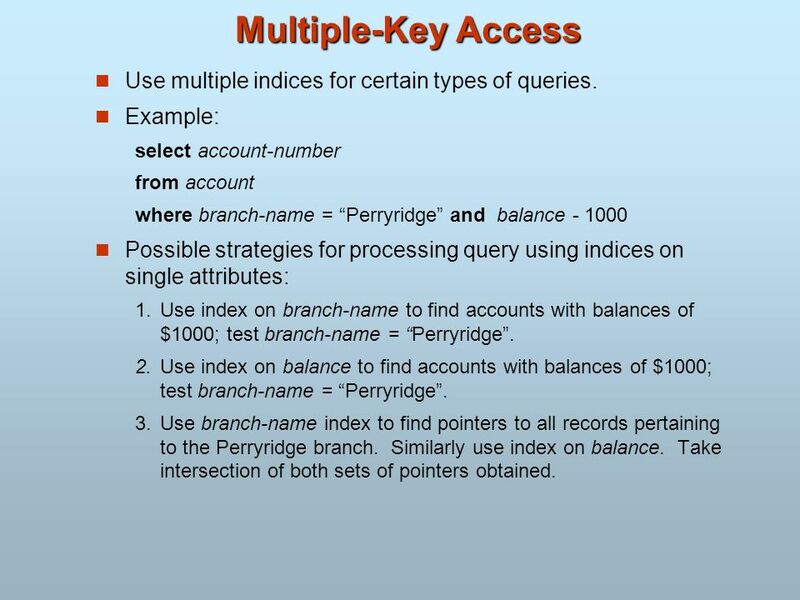 Example: select account-number from account where branch-name = “Perryridge” and balance Possible strategies for processing query using indices on single attributes: 1. 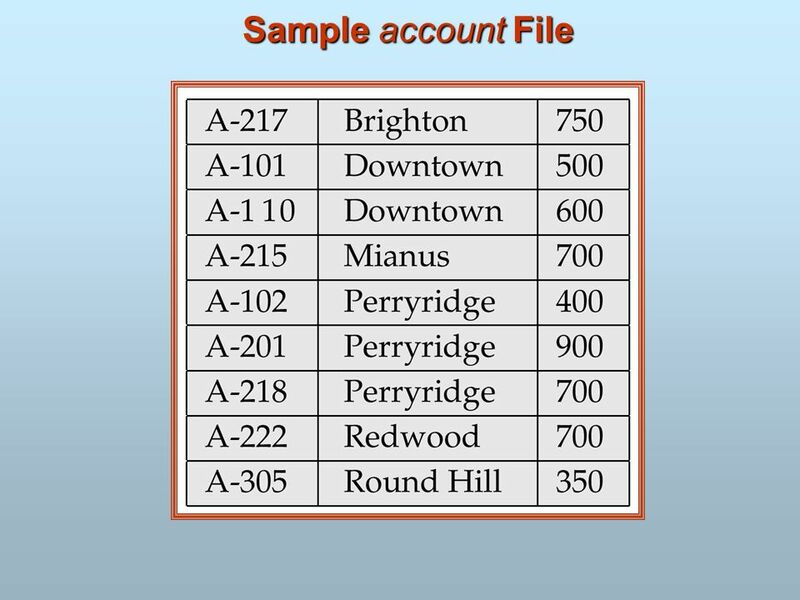 Use index on branch-name to find accounts with balances of $1000; test branch-name = “Perryridge”. 2. 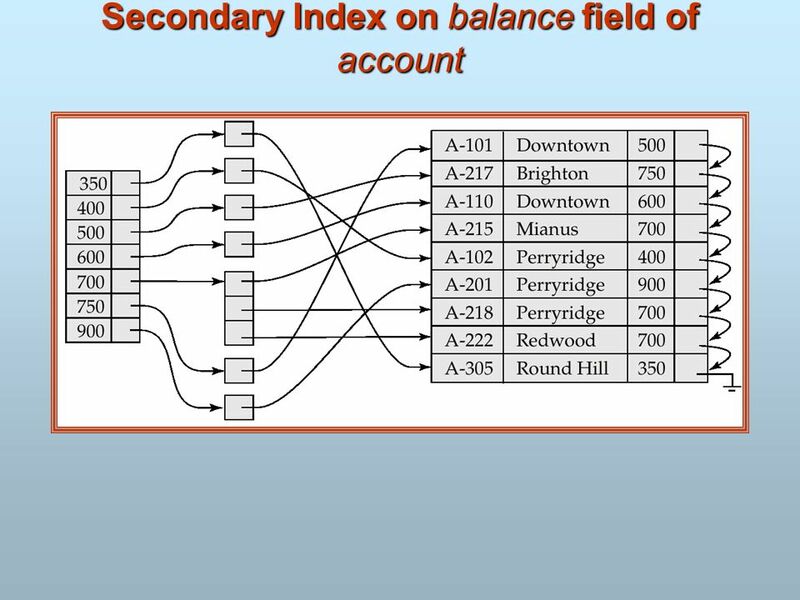 Use index on balance to find accounts with balances of $1000; test branch-name = “Perryridge”. 3. Use branch-name index to find pointers to all records pertaining to the Perryridge branch. Similarly use index on balance. Take intersection of both sets of pointers obtained. Suppose we have an index on combined search-key (branch-name, balance). 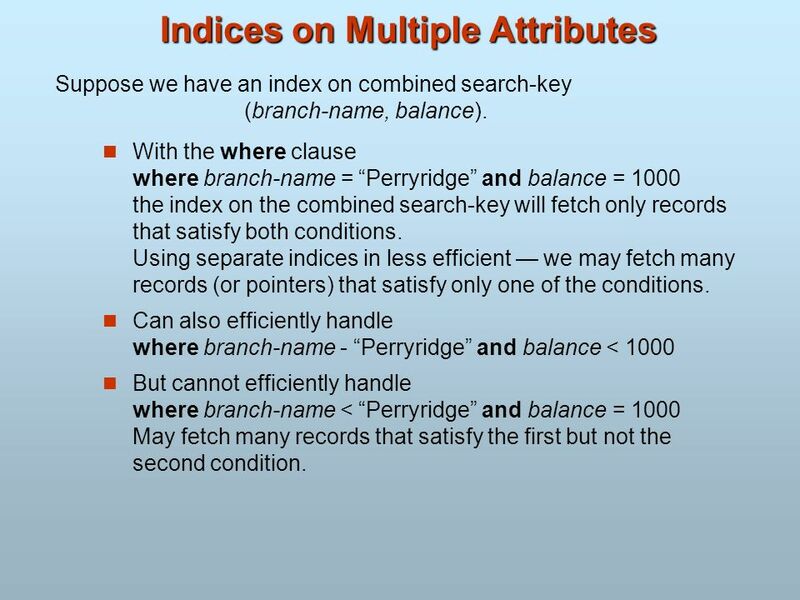 With the where clause where branch-name = “Perryridge” and balance = 1000 the index on the combined search-key will fetch only records that satisfy both conditions. Using separate indices in less efficient — we may fetch many records (or pointers) that satisfy only one of the conditions. 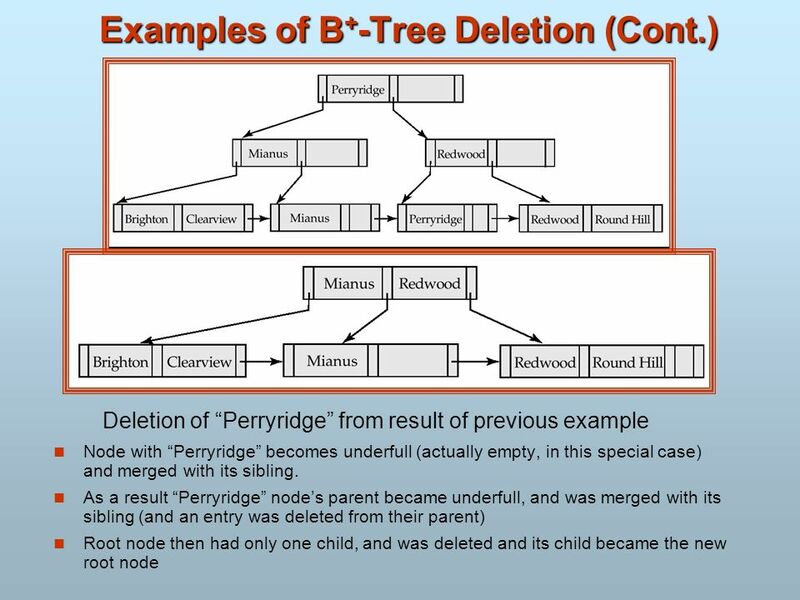 Can also efficiently handle where branch-name - “Perryridge” and balance < 1000 But cannot efficiently handle where branch-name < “Perryridge” and balance = 1000 May fetch many records that satisfy the first but not the second condition. 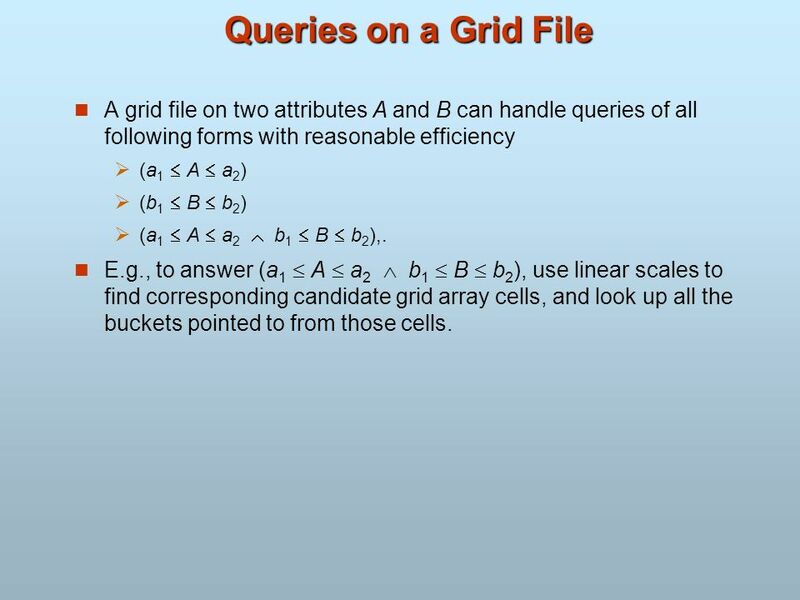 64 Queries on a Grid File A grid file on two attributes A and B can handle queries of all following forms with reasonable efficiency (a1  A  a2) (b1  B  b2) (a1  A  a2  b1  B  b2),. 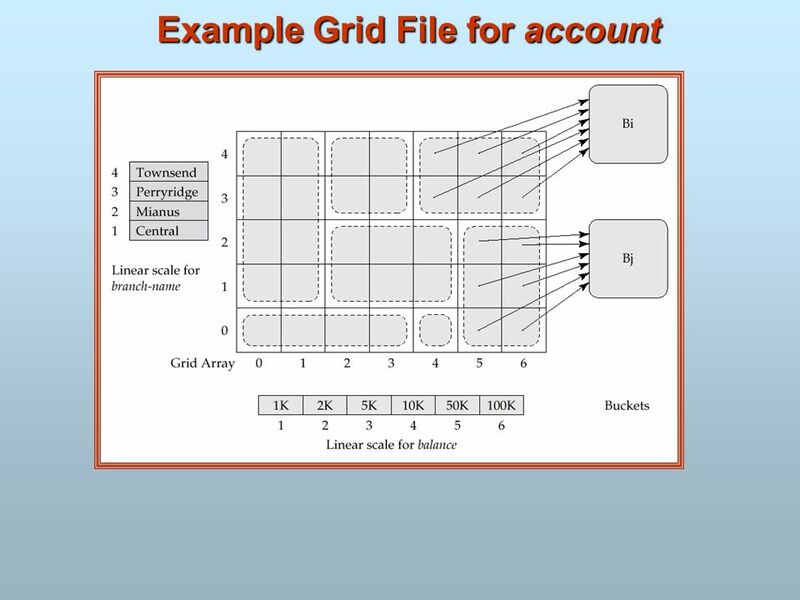 E.g., to answer (a1  A  a2  b1  B  b2), use linear scales to find corresponding candidate grid array cells, and look up all the buckets pointed to from those cells. 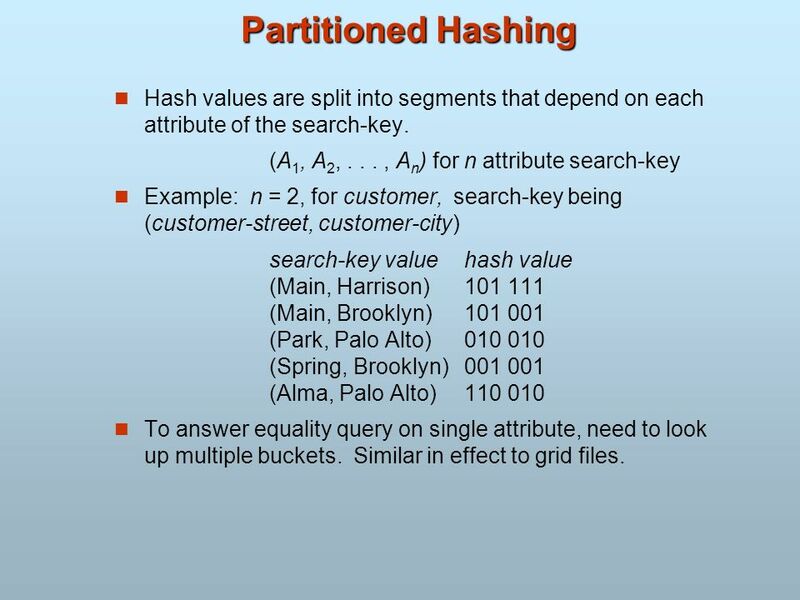 72 Partitioned Hashing Hash values are split into segments that depend on each attribute of the search-key. (A1, A2, , An) for n attribute search-key Example: n = 2, for customer, search-key being (customer-street, customer-city) search-key value	hash value (Main, Harrison) (Main, Brooklyn) (Park, Palo Alto) (Spring, Brooklyn) (Alma, Palo Alto) To answer equality query on single attribute, need to look up multiple buckets. 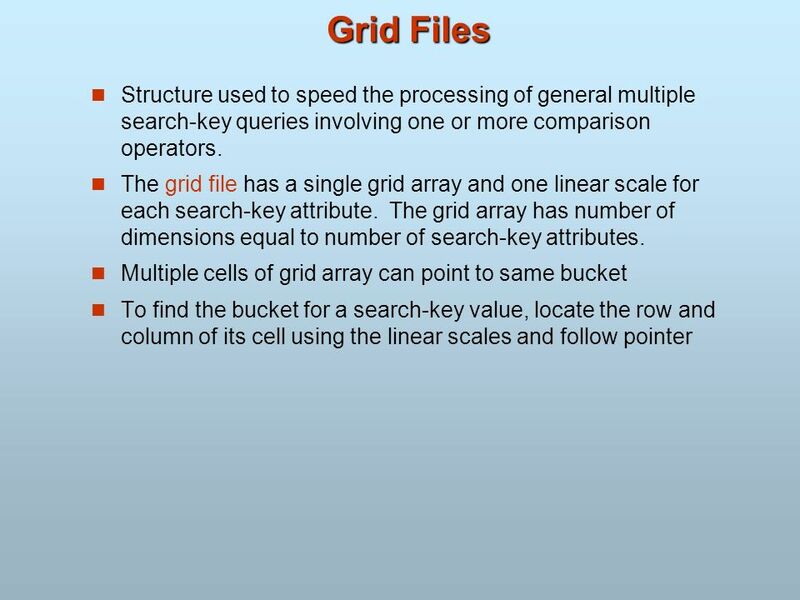 Similar in effect to grid files. 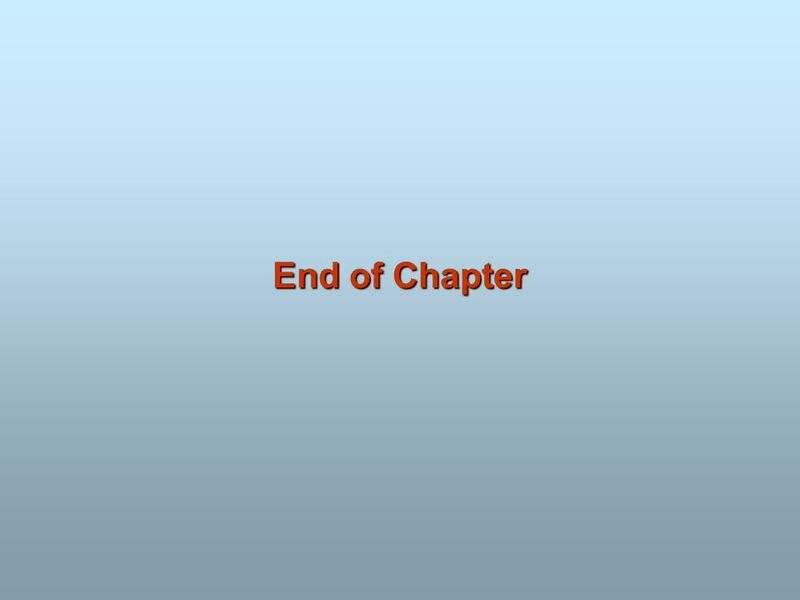 Download ppt "Chapter 12: Indexing and Hashing"
Database System Concepts, 6 th Ed. ©Silberschatz, Korth and Sudarshan See for conditions on re-usewww.db-book.com Chapter 11: Indexing. ©Silberschatz, Korth and Sudarshan12.1Database System Concepts Chapter 12: Part C Part A:  Index Definition in SQL  Ordered Indices  Index Sequential. 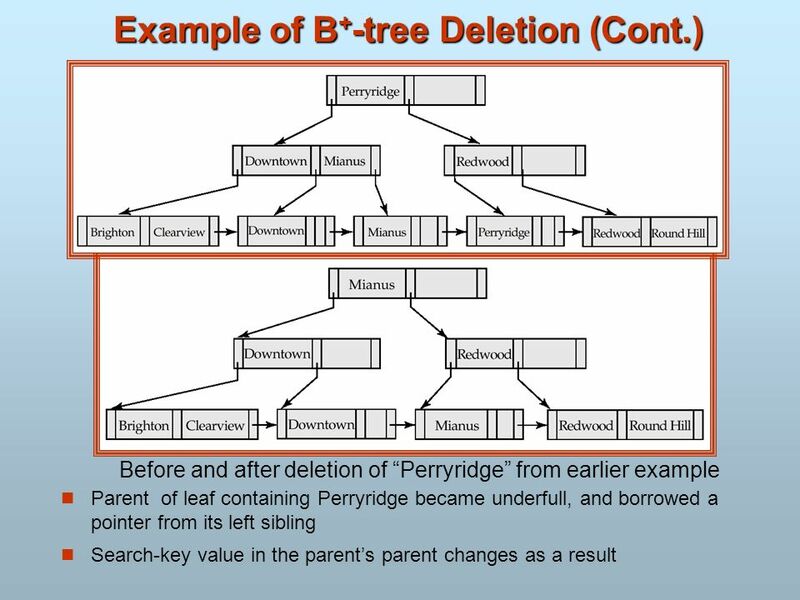 Quick Review of Apr 10 material B+-Tree File Organization –similar to B+-tree index –leaf nodes store records, not pointers to records stored in an original. 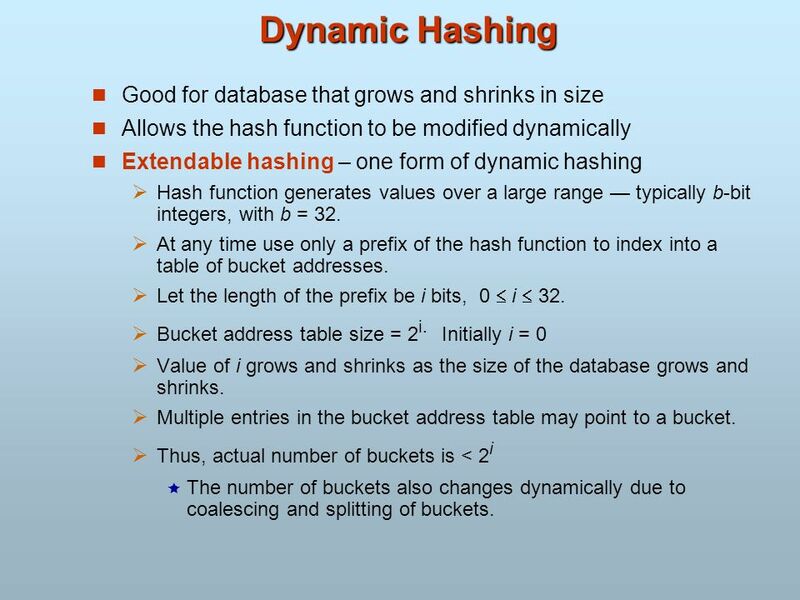 Department of Computer Science and Engineering, HKUST Slide 1 Dynamic Hashing Good for database that grows and shrinks in size Allows the hash function. 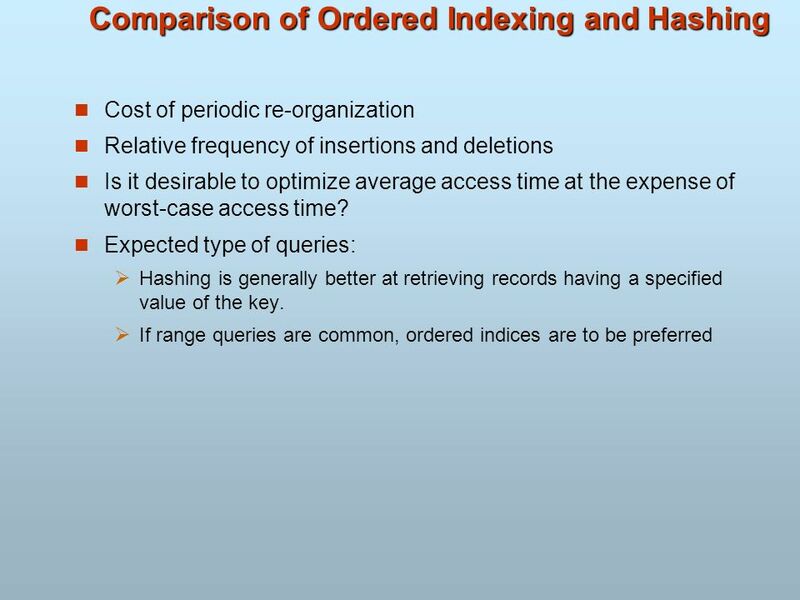 Indexing (Cont.) 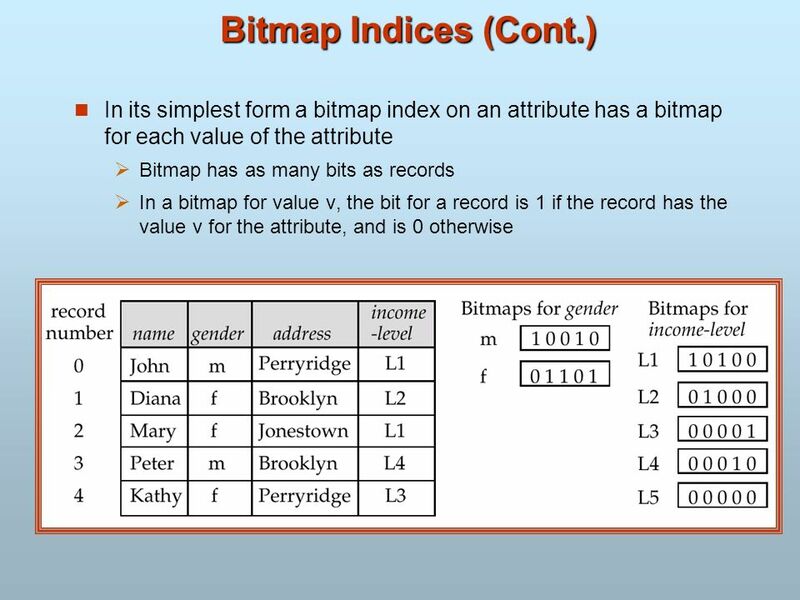 These slides are a modified version of the slides of the book “Database System Concepts” (Chapter 12), 5th Ed., McGraw-Hill,McGraw-Hill. Chapter 11 Indexing and Hashing (2) Yonsei University 2 nd Semester, 2013 Sanghyun Park. 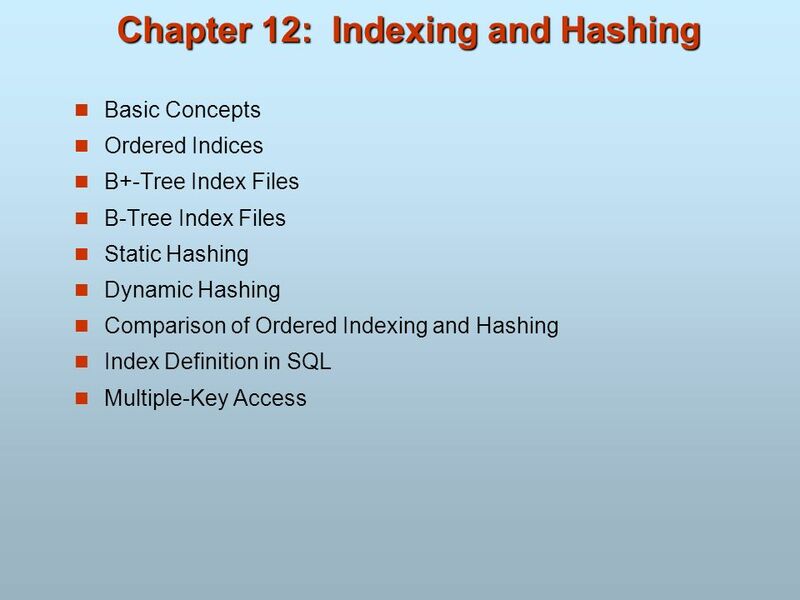 Chapter 12: Indexing and Hashing Chapter 12: Indexing and Hashing Basic Concepts Ordered Indices B + -Tree Index Files B-Tree Index Files Static. 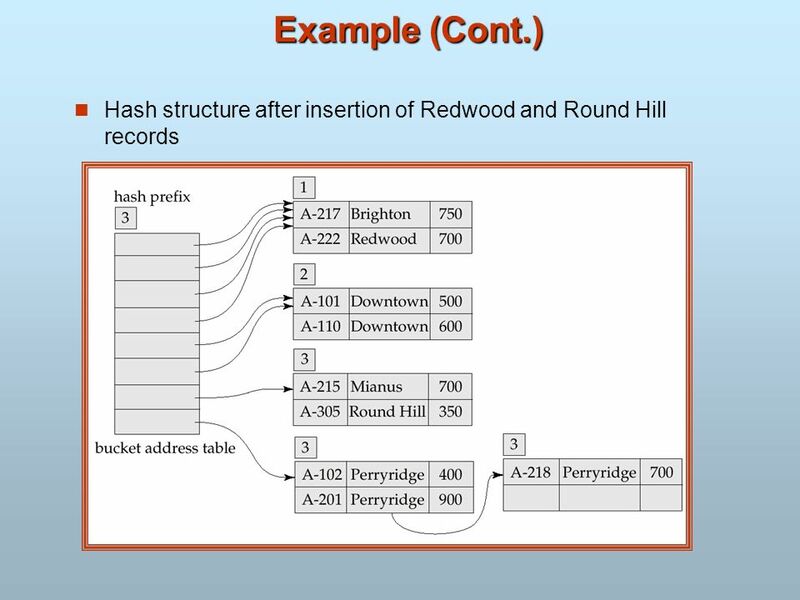 CIS552Indexing and Hashing1 Cost estimation Basic Concepts Ordered Indices B + - Tree Index Files B - Tree Index Files Static Hashing Dynamic Hashing Comparison. 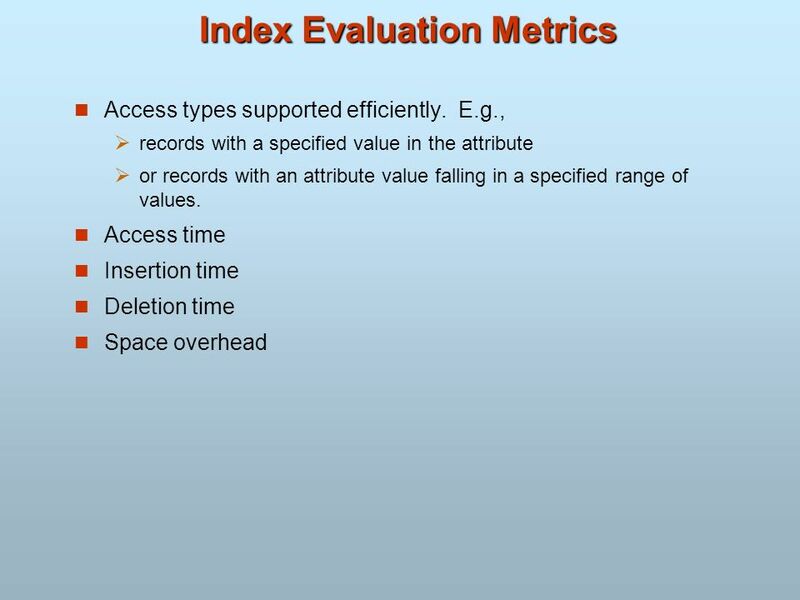 Index Basic Concepts Indexing mechanisms used to speed up access to desired data. E.g., author catalog in library Search Key - attribute to set of attributes. Database System Concepts, 5th Ed. ©Silberschatz, Korth and Sudarshan See for conditions on re-usewww.db-book.com Chapter 12: Indexing and. Database System Concepts, 5th Ed. ©Silberschatz, Korth and Sudarshan See www.db-book.com for conditions on re-usewww.db-book.com Chapter 12: Indexing and.